Oat Bread—You Asked for It! This is deliciously different bread. 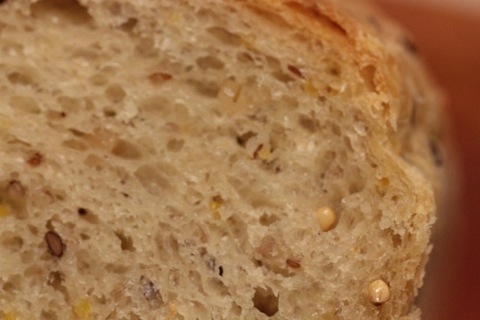 It is complex and earthy in flavor and texture, with a moist crumb and crunchy crust. It is especially great toasted and spread with unsalted butter. 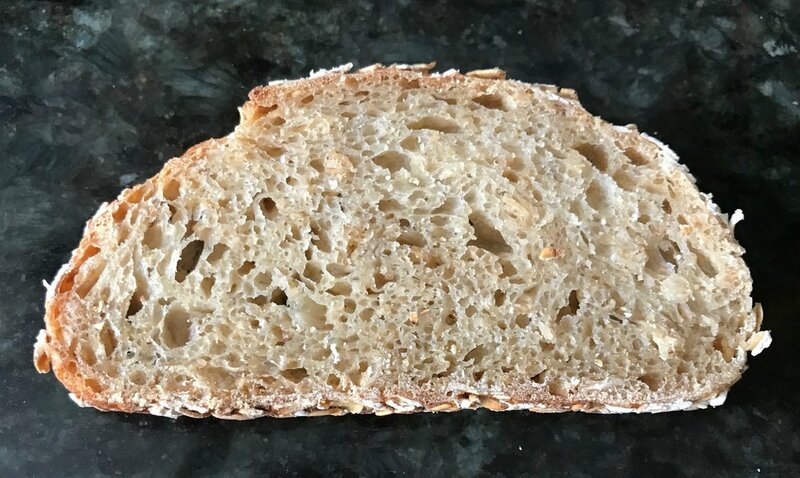 Chef Meltzer writes that due to the Biga (easily made preferment), and the exceptional moistness locked in by the cooked oats, the bread will keep at room temperature for 3 to 4 days. This recipe is for the experienced bread baker who doesn’t mind working with extremely sticky dough. After posting the photos of it on line, I got some requests for the recipe so I couldn’t resist offering it here. 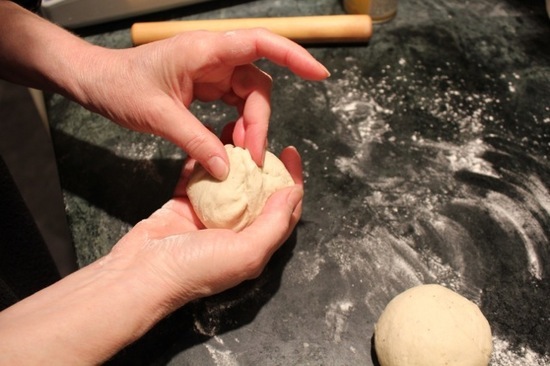 It is a recipe that has taken me 13 years to try, mostly because it was written for large quantity production, making it necessary to break down all the components precisely into a more manageable amount of dough. 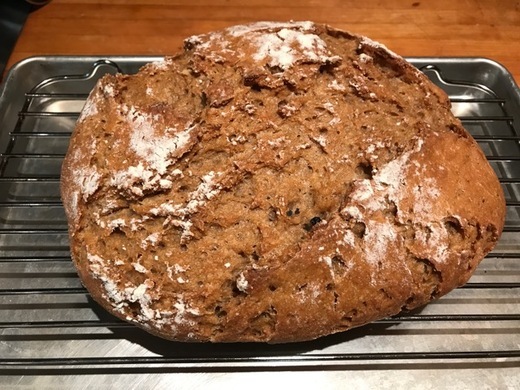 I have adapted the recipe for the home baker but it is a very tricky recipe if one doesn’t use weight, so I am not listing volume except for the small amounts of yeast which are not possible to weigh unless one has a precise scale for small amounts. 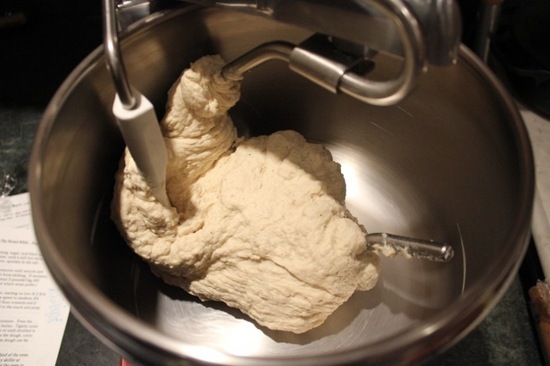 (The dough has a very low percentage of yeast—0.3% which gives it a long slow rise desirable for flavor and strength. It also has a high percentage of salt—2.6% that balances the oatmeal flavor and also helps to slow down the proofing). This dough has 35% oats, some of which gets cooked into a porridge consistency and others that get toasted. 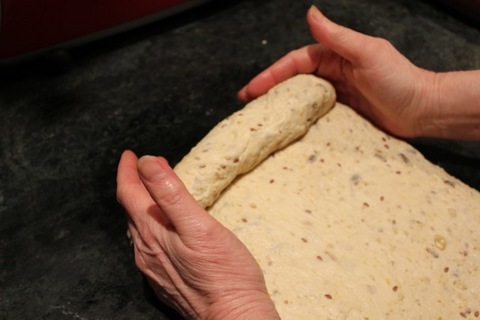 After the initial mixing the dough will be extremely wet and sticky, especially since the toasted oats take a while to absorb moisture, and it will begin to firm up considerably after proofing. 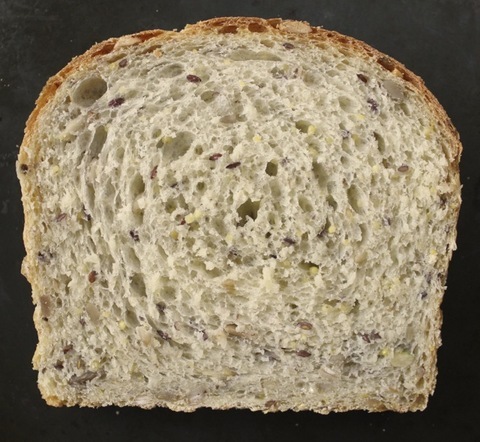 It is important to use high protein bread flour, such as King Arthur, to provide a strong network of gluten to support the oats. 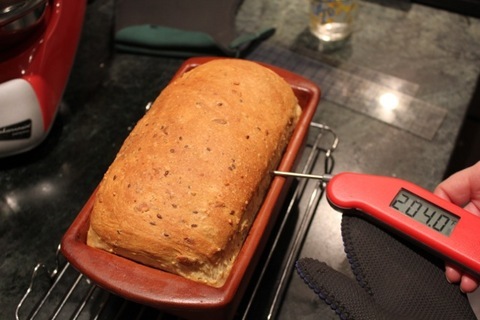 I followed the recipe exactly as it was written including the high baking temperature of 450˚F/230˚C, which I found, was too high for the oats encrusting the loaves, so I’m recommending 400˚F/100˚C. You will need some special equipment to make this recipe successfully. In addition to a scale, you will need an oven stone, a cast iron pan for ice to create steam for the bread, a baking peel, a sheet of parchment, and a linen proofing cloth in which to set the shaped loaves. 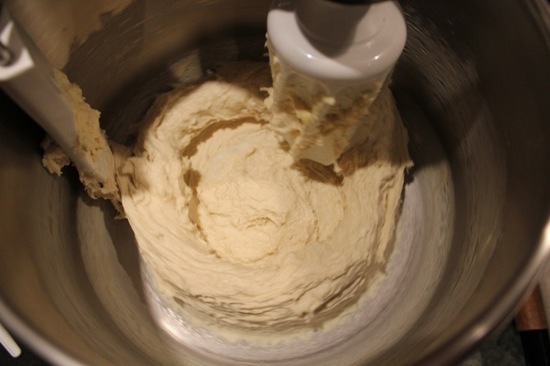 In a small container mix together all the ingredients to form very stiff dough. Coat the top with nonstick cooking spray, cover tightly, and let it sit until ready to mix the dough. It will become very soft but not stick to your fingers. The oats can be cooked a day ahead, lightly coated with nonstick cooking spray, covered with plastic wrap and refrigerated. 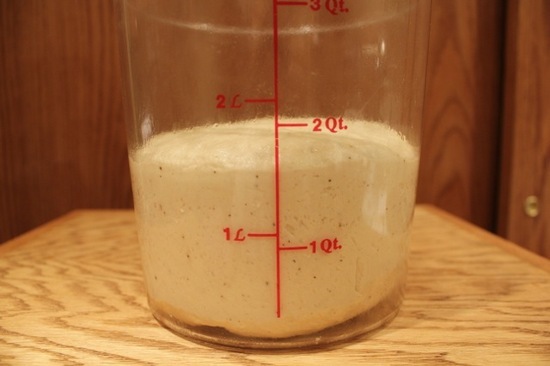 Bring it to room temperature before mixing the dough. In a saucepan, bring the water to a boil. Add the rolled oats. Cook on low heat, stirring often, until all the water is absorbed. Spread it on a small sheet pan that has been lightly coated with nonstick cooking spray. Cool completely. 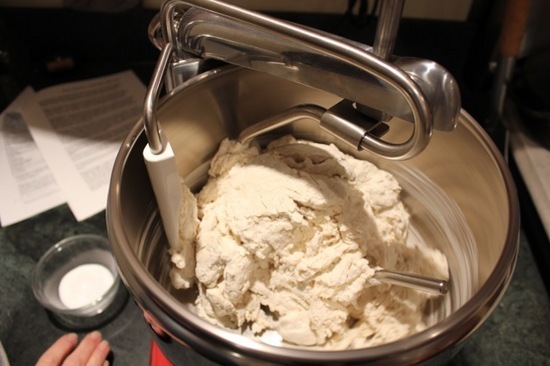 In the bowl of a stand mixer, fitted with the dough hook, add all the ingredients in the order listed. Mixed on low speed for 2 minutes or until all the flour is moistened. Raise the speed to medium and knead for 5 minutes. The dough will be exceptionally sticky. Scrape the dough into a 2 quart rising container, which has been lightly coated with nonstick cooking spray. Coated the top, covered it tightly, and set it in a warm spot—ideally 80˚F/27˚C. 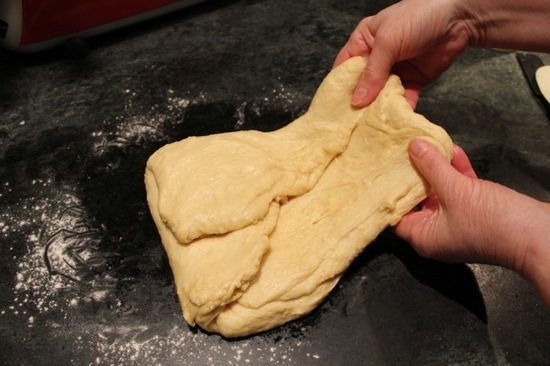 Divide the dough into two pieces, rounded it, and let it sit seam side up on a lightly floured counter for 15 minutes. Then shape it into bâtards (footballs). They will be about 9-1/2 by 3-1/2 inches. Roll each loaf with a damp towel and then roll them on a sheet pan filled with rolled oats. 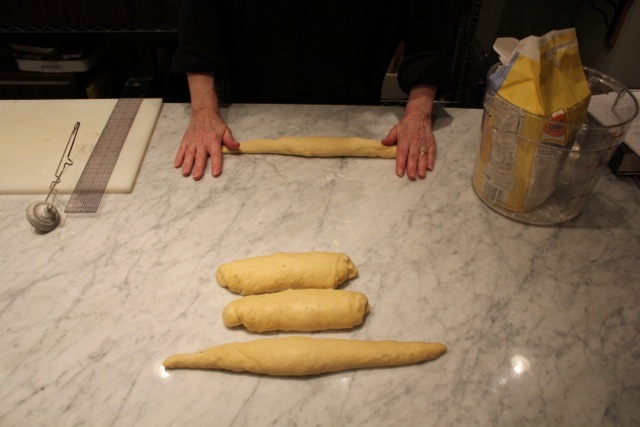 Set each loaf into the folds of an unfloured linen proofing cloth (couche) and use the cloth to lap over and over them. In a 70˚F/21˚C room they will take 2-1/2 hours to rise to 10 by 4 inches. A minimum of 45 minutes ahead, set the oven stone in the lower part of the oven and a cast iron pan on the floor of the oven, and preheat it to 400˚F/200˚C. Set a piece of parchment on top of the baking peel and using a bread flipping board or the linen cloth, flip each loaf over onto the parchment, spacing them a little apart. Make a long deep slash down the middle of each loaf and spray them with water. 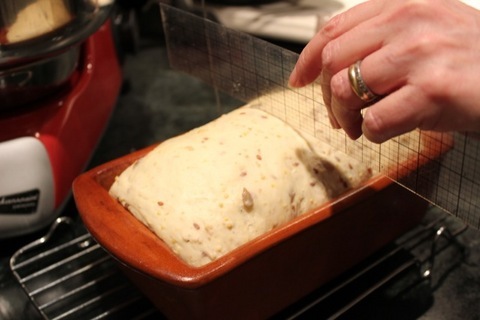 Use the peel to slip the parchment with the loaves onto the baking stone. Immediately toss a handful of ice cubes into the pan and close the oven door. Bake for 30 minutes. Rotate the loaves and if they are browning too quickly, tent loosely with a sheet of aluminum foil. 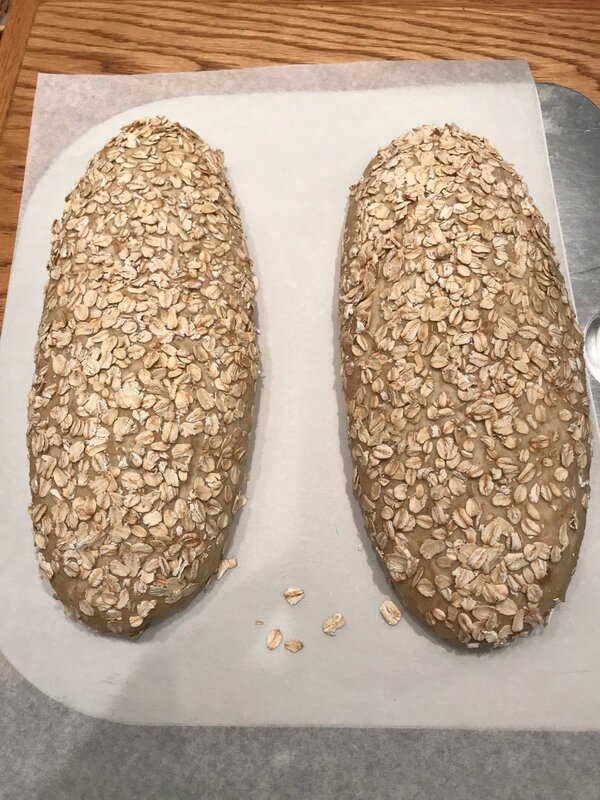 If the oats on the bottoms of the loaves are browning too much, transfer the loaves to a baking sheet. 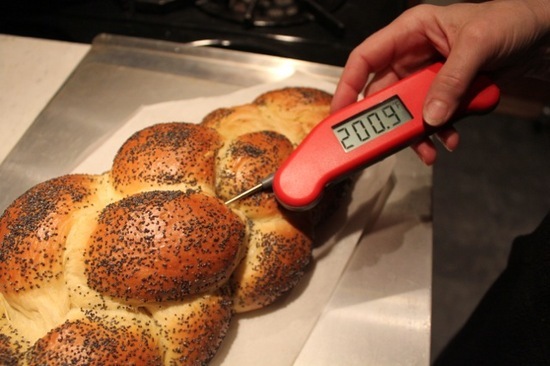 Continue baking until an instant read thermometer reads 207˚F/ 97˚C. I fell in love with durum flour years ago on a trip to Sicily when I discovered that it was responsible for the golden color and sweet nutty flavor of the bread. I had been using it for pasta, adding a little bread flour to give it more elasticity and loved the firm al dente texture and delicious flavor. So when Beatrice Ughi of Gustiamo sent me a bag of the Pane Nero flour they just started to import I couldn't wait to try it for bread baking. (Gustiamo is a terrific site for many wonderful products from Italy) This flour, called Pane Nero, is a blend of 30% Tumminia, a whole ancient grain, and 70% durum semolina. It has a heavenly aroma and is the color of golden sand. I jumped right in and tried my recipe for no knead bread using 100% of this flour. I added 75 grams of my old sour dough starter to give it more structure and I needed to add 50 grams -almost 1/4 cup more water and the resulting loaf, though it rose well, had no oven spring and was too dense and hard. 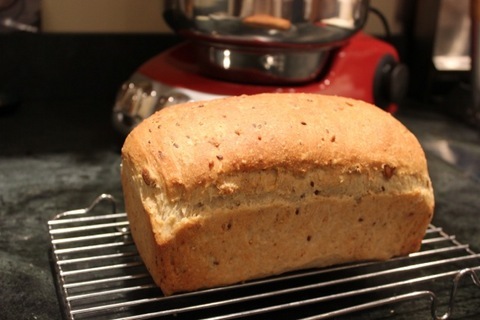 Next I tried it using the recipe for my favorite part whole wheat bread. 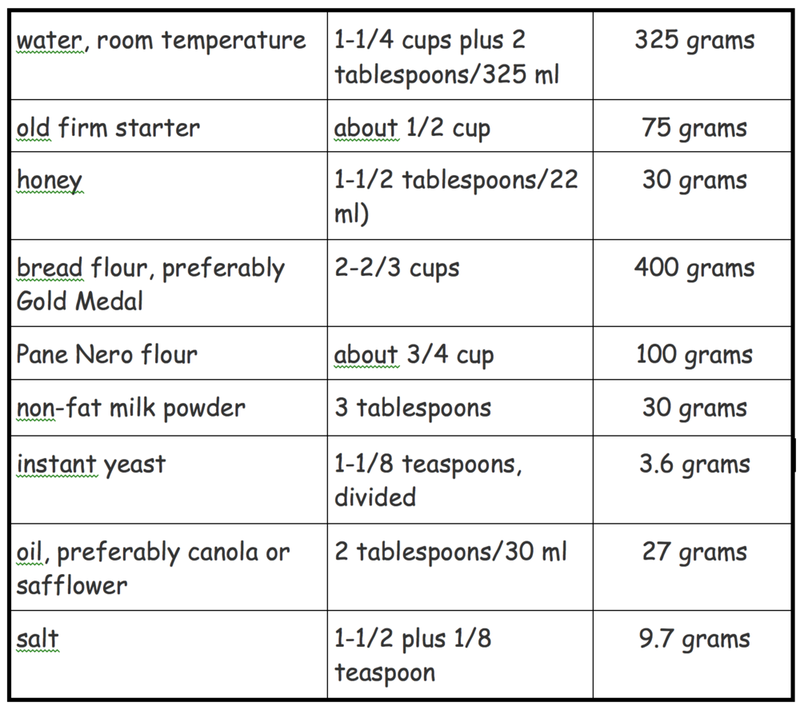 I replaced the whole wheat flour with equal weight pane nero. I also added my usual firm sour dough starter (I freeze the leftover starter every week after feeding it, so it is not replacing commercial yeast but rather it contributes to the structure, shelf life and flavor). A whole new bread was born--a new favorite! 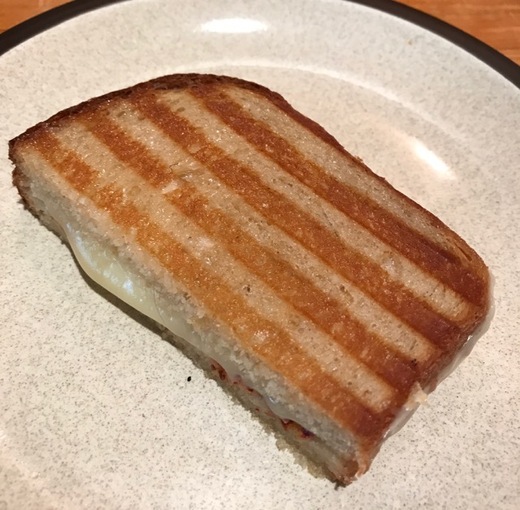 Not only is this bread exceptionally flavorful, it has the perfect degree of density, making it possible to accommodate spreads without tearing, and not squishing down when making a grilled cheese sandwich on a panini press. Note: pane nero flour is organic and, as with all organic wheat that has not been sprayed with any sort of insecticide, it is advisable to freeze it for 48 hours when it first arrives to ensure that it remains bug free. It will remain fresh for well over a year in the freezer, and for up to 3 months refrigerated. Equipment: A 9 inch by 5 inch (7 cup), or 8 1/2 by 4 1/2 inch loaf pan if not adding the starter, greased lightly with cooking spray or oil. A baking stone or baking sheet. 2) Mix the dough: Add the rest of the flour mixture and, with the dough hook, mix on low speed (#2 Kitchen Aid) about 1 minute, until the flour is moistened to form a rough dough. Scrape down any bits of dough. Cover the top of the bowl with plastic wrap and allow the dough to rest for 20 minutes. Add the oil and knead the dough on low speed (#2 Kitchen Aid) for 7 minutes, adding the salt after the oil is mixed in. (If not using the starter, use only 1-1/2 teaspoons/9 grams of salt.) (In the bread machine, mix it for 3 minutes and then autolyse--let rest--for 20 minutes. 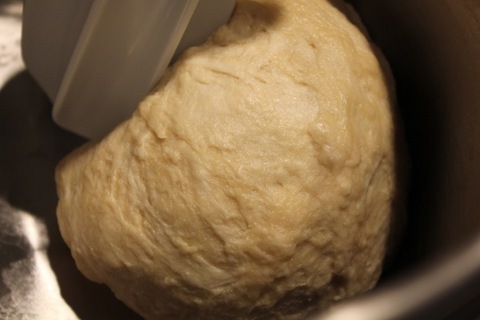 Add the oil and knead for 7 minutes, adding the yeast after the first minute and the salt after the yeast is mixed in.) 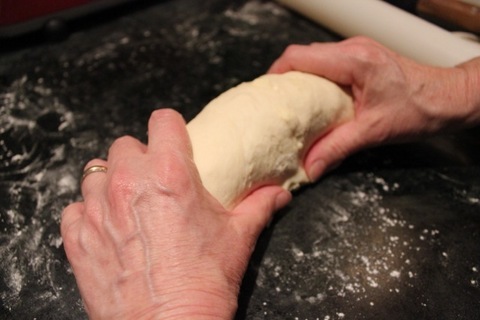 The dough should be sticky enough to cling to your fingers. If it is not at all sticky spray it with a little water and knead it. 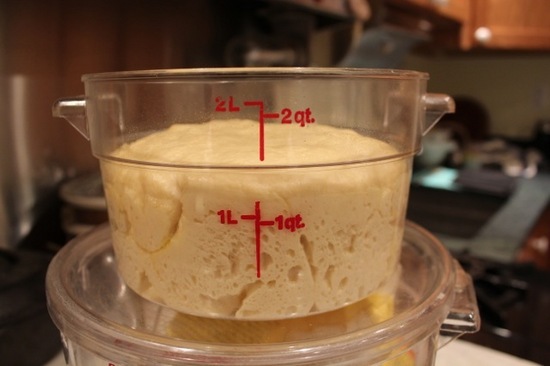 (The dough should weigh about 986 grams/ a little over 2 pounds--about 1 quart/liter). 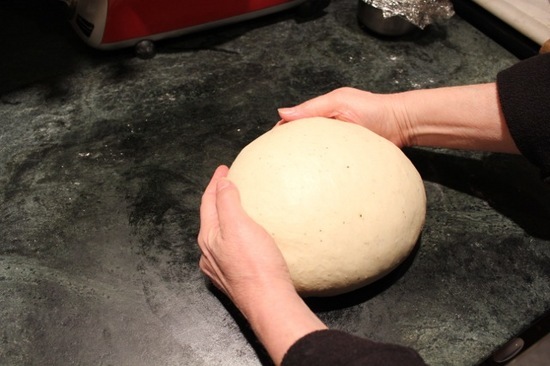 3) Let the dough rise: Place the dough into a 3 quart or larger dough rising container greased lightly with cooking spray or oil. Press down the dough and lightly spray or oil the top. Cover the container tightly with a lid or plastic wrap. With a piece of tape, mark where double the height would be. 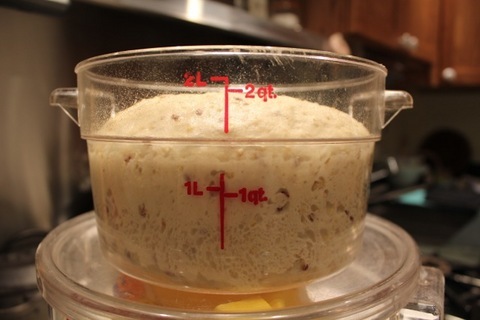 Allow the dough to rise (ideally at 80°F/26°C.) until doubled in size (to 2 liters), about an hour and 10 minutes. (at 75°F/24°C 2 hours + 15 minutes.) Using an oiled spatula or dough scraper, remove the dough to a lightly floured counter. Press down on it gently to form a rectangle. 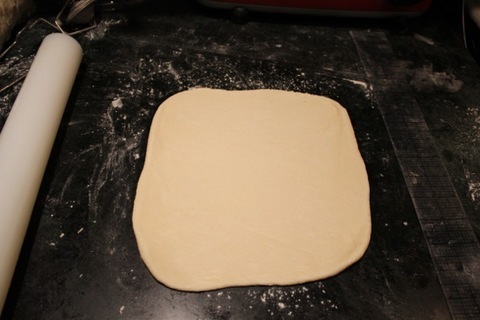 Stretch the dough and give it a package fold (pull out the bottom and fold it to the center, then the same with the left side, right side, and top), round the edges and return it to the bowl, smooth side up. Again, oil the surface, cover, mark where double the height will now be (3 quarts) and allow it to rise until it reaches this point, about 1 hour. (Or dimple and shape it into a loaf after it has rested 20 minutes; set it in an oiled zipseal bag; refrigerate it overnight and bring it to room temperature for about 1 hour or until risen full as indicated in step 4 before baking. 5) Preheat the oven: 1 hour before baking set a cast iron pan lined with foil onto the floor of the oven and preheat the oven to 450°F/230°C. 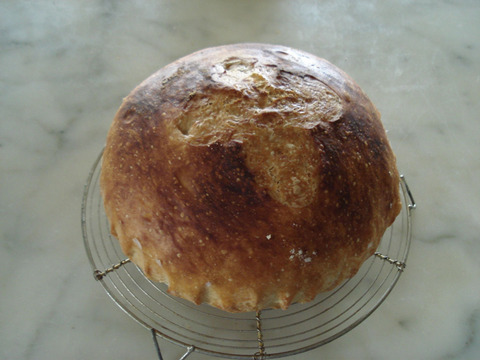 6) Bake the bread: Spritz the top of the dough with water. Quickly but gently set the bread pan onto the hot stone or hot baking sheet and toss 1/2 cup of ice cubes into the pan beneath. 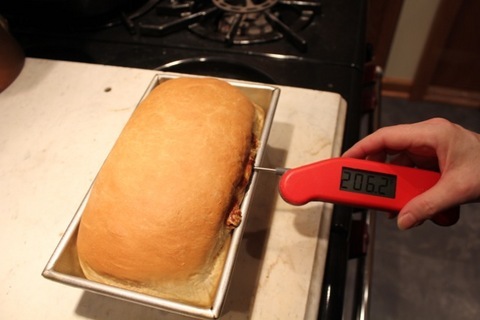 Immediately shut the door, lower the temperature to 400°F/230°C, and bake 30 to 40 minutes or until the bread is golden brown and a skewer inserted in the middle comes out clean. (An instant read thermometer inserted into the center will register about 205°F/96°C. After the first 20 minutes of baking tent loosely with foil and rotate the pan half way around for even baking. 7) Cool the bread: Remove the bread from the oven, unmold it from the pan, and transfer it to a wire rack to cool completely, top-side up. The Night Ahead Soak Grains Place the grain mixture in a medium bowl, add the hot water, and stir until thoroughly combined. Cool to room temperature, cover and refrigerate for 8 or up to 24 hours. 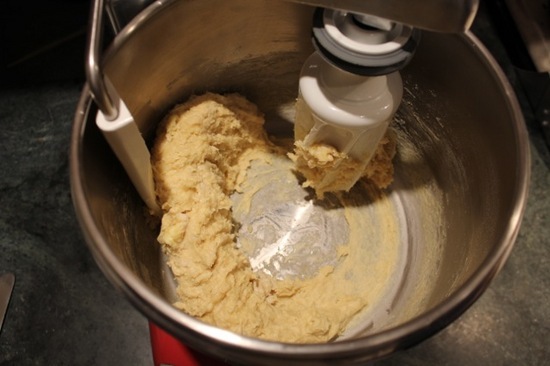 Soften the Starter Into the bowl of a stand mixer bowl, fitted with the roller attachment for an Ankarsrum, or dough hook for other stand mixers, pour the water. Use sharp scissors, dipped in water if it is sticky, to cut the starter into many small pieces, letting them drop into the water. Combine the Ingredients for the Flour Mixture In a medium bowl, add the bread flour, yeast, malt, and vital wheat gluten. Add it to the starter mixture. Mix the Dough With the dough hook (in the Ankarsrum use the roller), mix on low speed for about 1 minute, until the flour is moistened and the dough is in shaggy pieces. Cover the top of the bowl with plastic wrap or a towel and autoylyse (let rest) 15 to 20 minutes. Raise the speed to medium-low, slowly add about half of the cannola oil, and knead for 7 minutes. 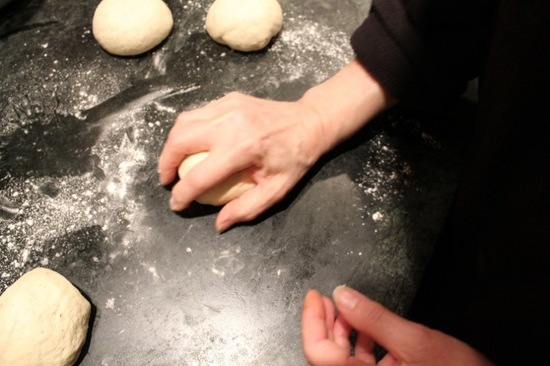 It's fine to manually move the arm toward the center to help the dough to integrate the oil. The dough will be soft and smooth. 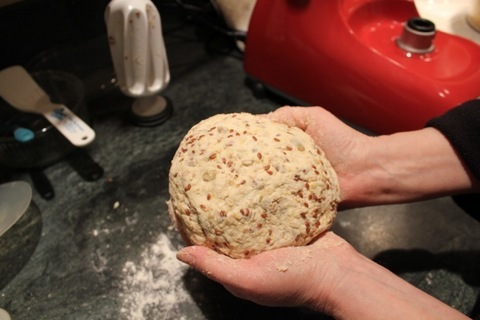 Add the seed mixture and the remaining oil, and knead for another 3 minutes or until evenly incorporated. 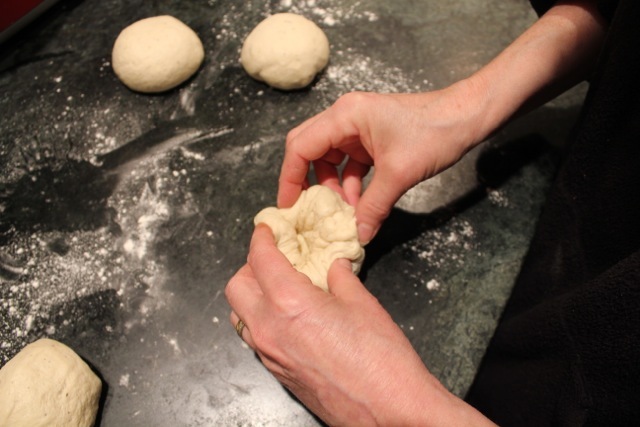 Sprinkle on the salt and continue kneading for another 2 minutes, adding the durum flour. (If replacing the durum flour with bread flour you will need a little extra flour.) The dough should clean the bowl and be just barely tacky (slightly sticky). 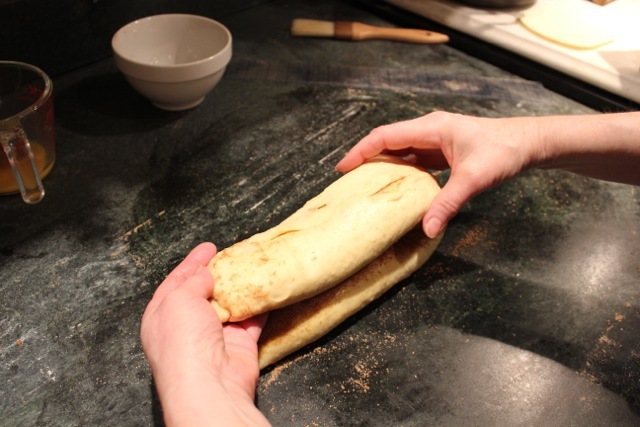 Shape the Dough and Let It Rise Turn the dough onto a lightly floured counter. Dimple the dough all over and use a rolling pin to roll it to about 14 inches by 7-1/2 inches to flatten it and press out the air bubbles. Shape it into a loaf, keeping the sides from getting wider by pushing them in as your roll. Pinch the bottom seam. 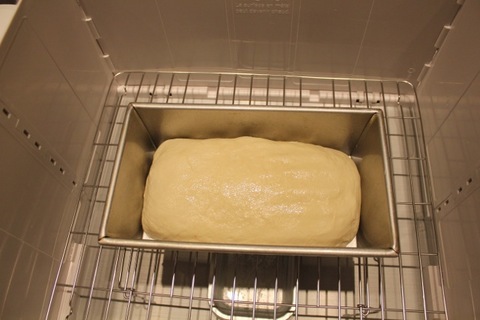 Set it in the prepared bread pan, seam side down. When flattened with the palm of your hand it should be about 1/2 to 3/4 inch from the top. Set it in a proofer with a container of hot water or cover it with a large container or oiled plastic wrap. and let the dough rise until doubled and when pressed gently with a finger the depression very slowly fills in, about 40 to 50 minutes. It will be about 1-1/4 inches above the sides of the pan. Preheat the Oven Forty-five minutes or longer before baking, set an oven rack in the lowest level and place the baking stone or baking sheet on it. Place a cast iron pan, lined with aluminum foil to prevent rusting, or a sheet pan on the floor of the oven. Preheat the oven to 400°F/200°F. Bake the Bread Spritz the top of the bread. Place the pan onto the baking stone and toss 1/2 cup of ice cubes into the pan beneath. Immediately shut the door and bake 20 minutes. Turn it around and bake another 15 to 20 minutes (207°F/97°C). Cool the Bread Remove the bread from the oven, invert it from the pan, and transfer it to a wire rack to cool completely, top-side up. 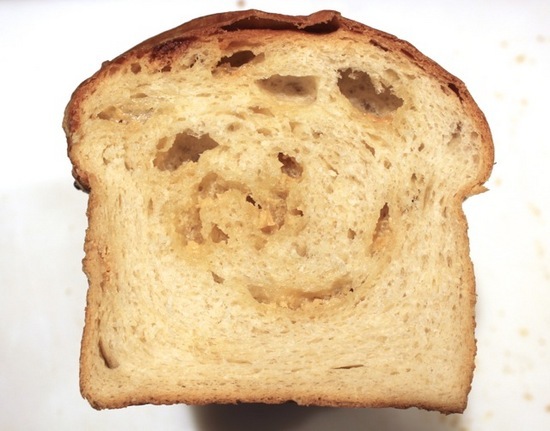 Vital wheat gluten really shines here as it strengthen the protein network of the dough enough to support the large amount of grains that tend to cut through gluten strands and thus would result in an unpleasantly dense bread. It is preferable to use the Red Star platinum yeast which will result in a perfectly smooth exterior with no slight tearing where the dough rises above the top of the pan. You will need only half the amount of vital wheat gluten which can be replaced with 10 grams of flour. Make the Biga In a small bowl, whisk together the flour and yeast. With a silicone spatula or wooden spoon, stir in the water. Continue stirring for 3 to 5 minutes, or until very smooth. 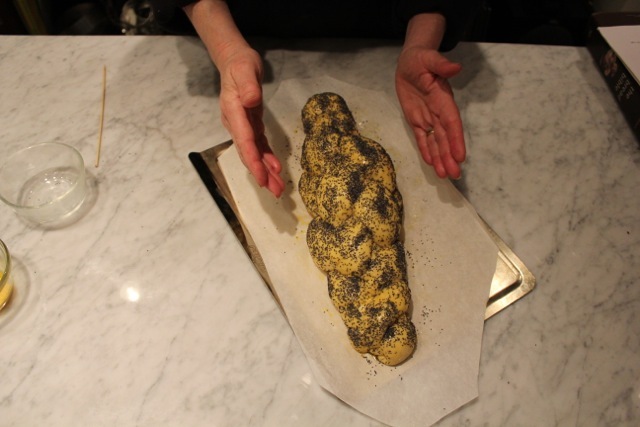 The biga should be tacky enough to cling slightly to your fingers. Cover the bowl tightly with plastic wrap that has been lightly coated with nonstick cooking spray (or place it in a 1 cup food storage container that has been lightly coated with nonstick cooking spray and cover it with a lid). Set it aside until almost doubled in volume (to 3/4 cup) and filled with bubbles. At warm room temperature or in the proofer (80°F/27°C), this will take about 4 to 6 hours. Stir it down. Refrigerate it for 3 days before making the dough. I've always made babka in a fluted tube pan. My latest version is in my new book The Baking Bible. 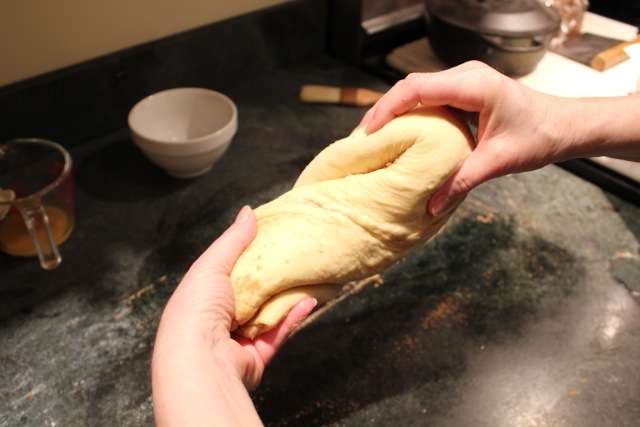 But here is another way to shape a babka giving it a twisted shape that causes the dough and filling to spiral in an appealing way. I discovered the technique in an article by Erika Bruce in Cook's Country, December/Jan 2012. 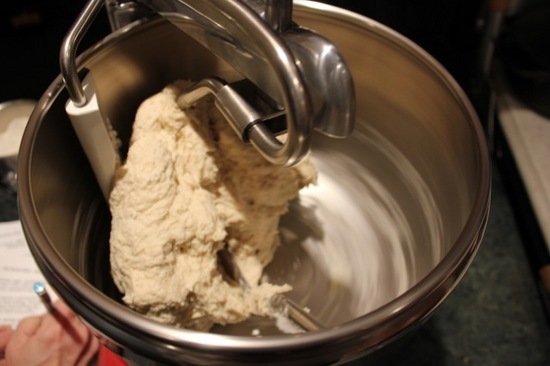 Make the Dough Starter (Sponge) In the bowl of a stand mixer, place the water, flour, dry milk, and yeast. Whisk by hand for about 2 minutes until very smooth to incorporate air. 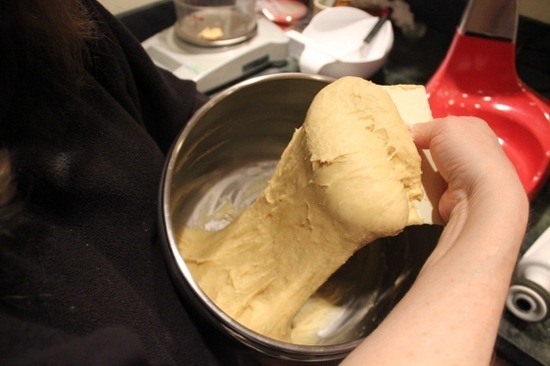 The dough will be the consistency of a thick batter. Scrape down the sides of the bowl. Cover with plastic wrap and set the starter aside while you make the flour mixture. 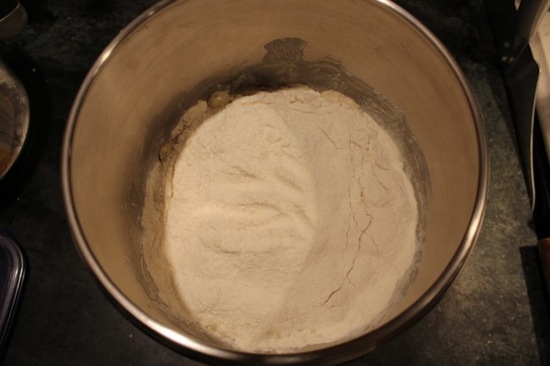 Combine the Flour Mixture In a medium bowl, whisk together the flour, sugar, and yeast. Then whisk in the salt. Sprinkle the flour mixture over the sponge, forming a blanket of flour, and cover it tightly with plastic wrap. Let it ferment for 1 to 4 hours at room temperature, or 1 hour at room temperature and up to 24 hours refrigerated. During this time, the sponge will bubble through the flour blanket in places. Mix the Dough Attach the roller if using the Ankarsrum, or the dough hook if using another stand mixer). 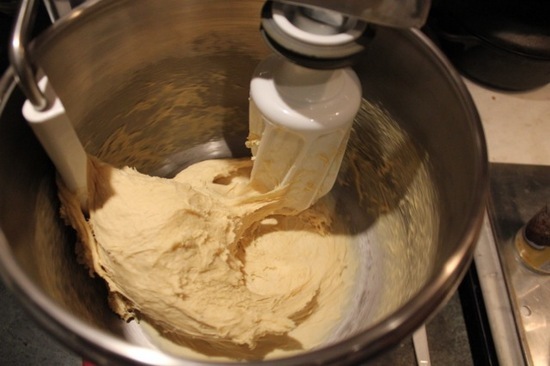 Add the butter, eggs, water, and vanilla, and beat on low speed for about 1 minute, or until the flour is moistened. Raise the speed to medium and knead for about 7 minutes, or until the dough is shiny and very elastic. It will not clean the sides of the bowl, but it will be very stretchy when pulled with your fingers. The dough will be very sticky. Let the Dough Rise Using a spatula or dough scraper that has been lightly coated with nonstick cooking spray, scrape the dough into a 2 quart/2 liter dough rising container or bowl that has been lightly coated with nonstick cooking spray. (It will increase slightly in weight after rolling and folding it.) It will be very soft and elastic and will stick to your fingers unmercifully. Do not be tempted to add more flour at this point; the dough will firm considerably after rising and chilling. 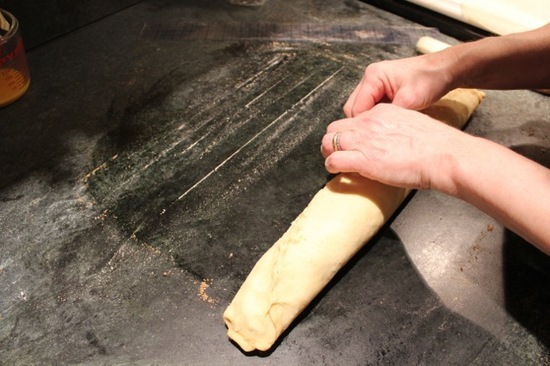 Push down the dough and lightly coat the surface with nonstick cooking spray. 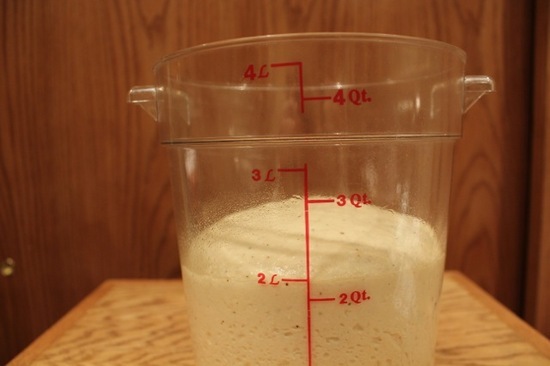 (The dough should weigh about 24.2 ounces/687 grams.) Unless putting it in an enclosed area with hot water, cover the container with a lid or plastic wrap. With a piece of tape, mark the side of the container at approximately where double the height of the dough should be after rising. 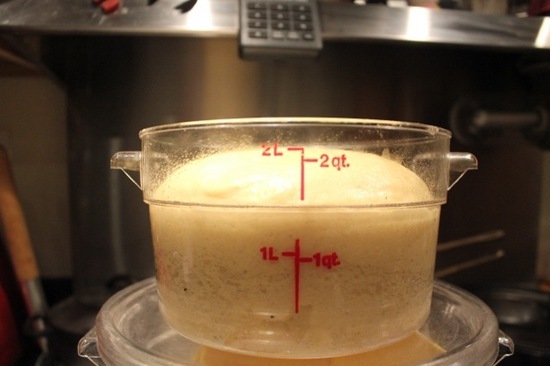 Let the dough rise in a warm place (ideally at 75° to 85°F/24° to 29°C) until it reaches the mark, about 1 to 1-1/2 hours. Make the Sugar Filling Using a medium-mesh strainer, sift the sugars and cinnamon into a medium size bowl and whisk to combine them evenly. 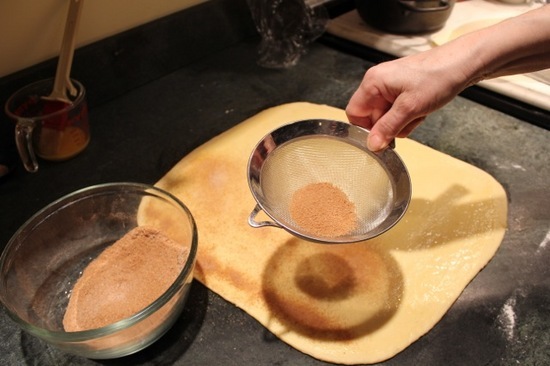 Place 2 tablespoons of the cinnamon sugar mixture into a small bowl. 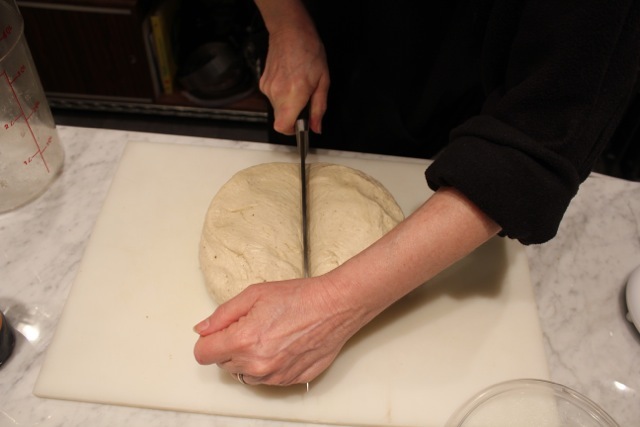 Shape the Dough, Fill, and Let It Rise Turn the dough onto a well-floured counter and press down on it with floured hands to form a rectangle. 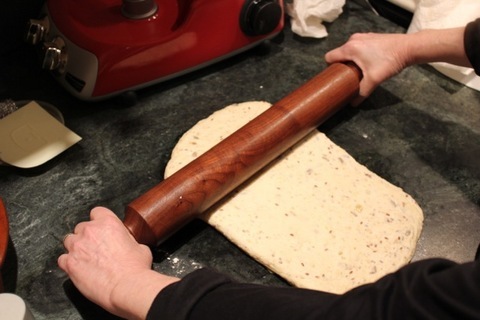 Roll the dough into a 16 by 14 inch wide rectangle, flouring the counter and the rolling pin if necessary to keep the dough from sticking. It will be about 1/4 inch thick. Brush off any excess flour from the top. 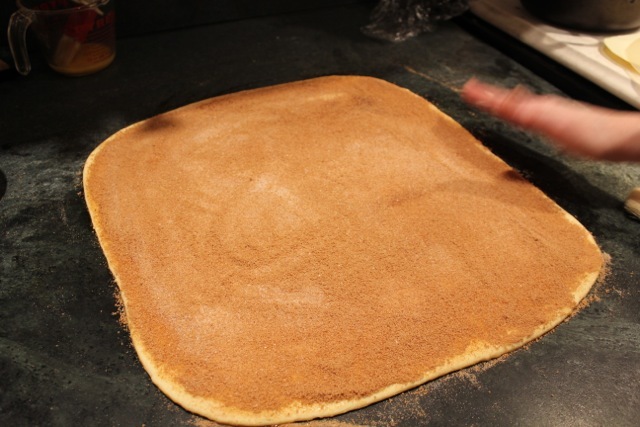 Sift the cinnamon mixture onto the dough and use your fingers to smooth the mixture as evenly as possible over the dough. 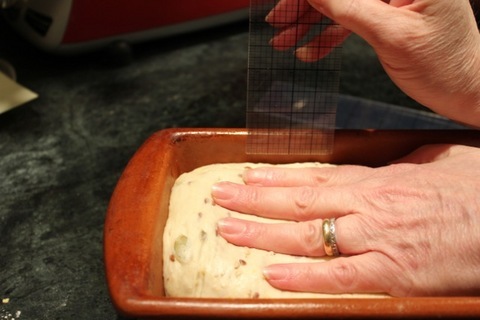 Starting from the top, use your fingers and a long plastic ruler to roll up the dough and to help support the dough as you roll it. 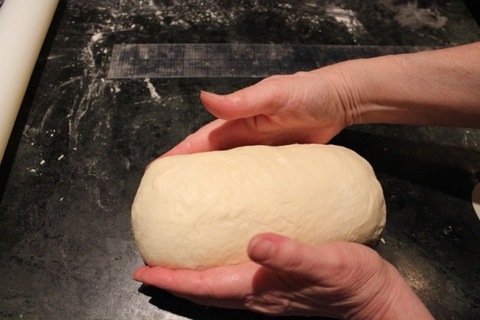 (Slip the edge of the ruler slightly under the dough and use it to lift up and roll the dough.) 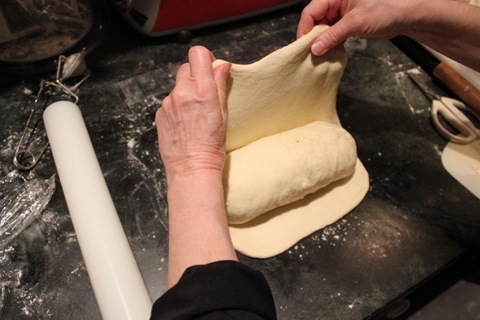 With each roll, dust any flour from the surface of the dough, and press firmly all along the dough roll, pinching it gently together to keep it from separating. 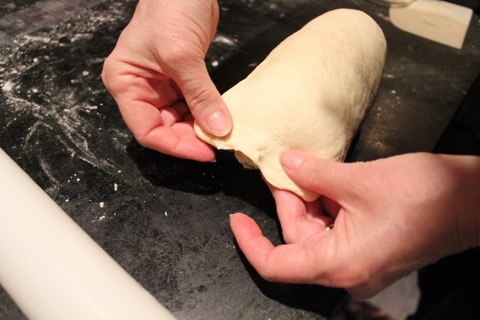 To keep the rolled dough even and prevent it from becoming thicker in the middle, use your hands to ease the dough gently toward the ends. Work carefully without rushing. 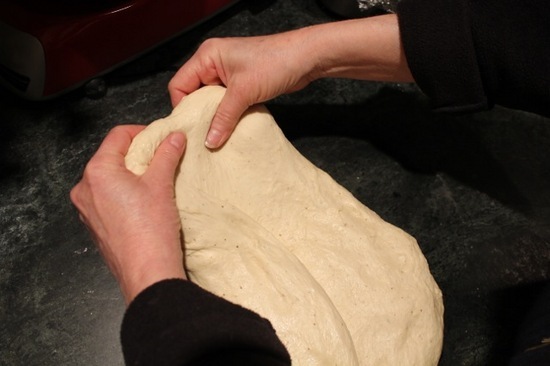 When you reach the bottom edge of the dough, pinch it firmly against the outside of the dough to make a tight seam. Set the dough log seam side down. 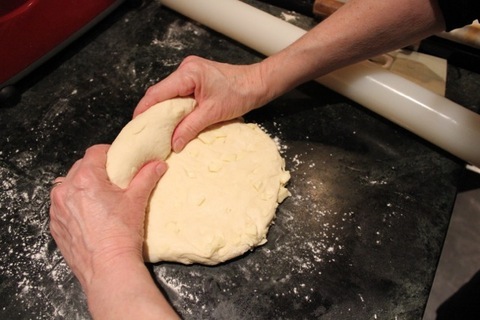 Pinch the ends of the dough firmly together and brush off any excess flour. 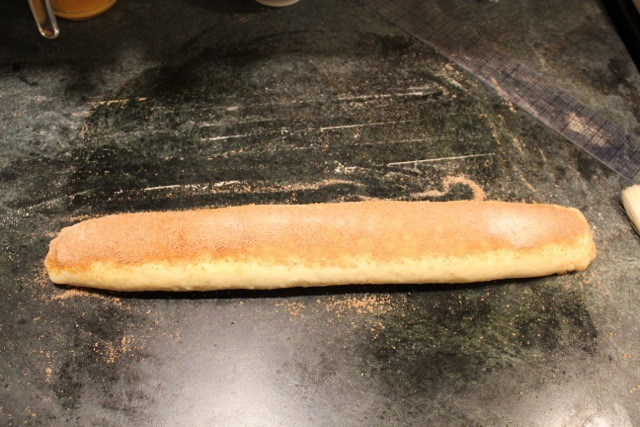 The dough roll will be about 18 inches long and quite floppy. Brush it with the beaten egg, sprinkle with the reserved filling mixture, and fold it over itself. 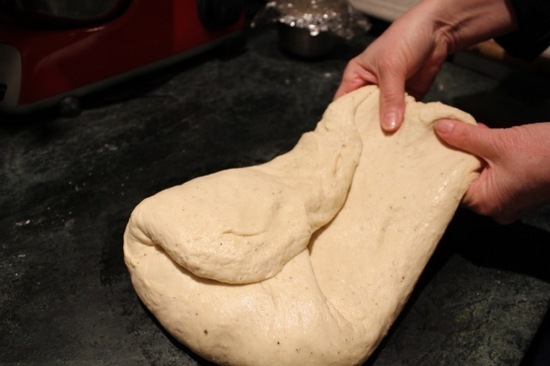 Gently twist the dough twice and set it into the prepared pan. Press it down firmly into the pan. The highest point will reach to about 1 inch from the top of the pan. Cover the pan loosely with plastic wrap, lightly coated with nonstick cooking spray. Let the dough rise in a warm place (ideally 75° to 85°F/24° to 29°C) for 45 minutes to 1-1/2 hours, or until the highest point is about 1 inch above the top of the pan. Preheat the Oven Twenty minutes or longer before baking, set an oven rack in the lower third of the oven and set a cast iron pan, lined with aluminum foil to prevent rusting, or a sheet pan on the floor of the oven. Preheat the oven to 350°F/175°C. 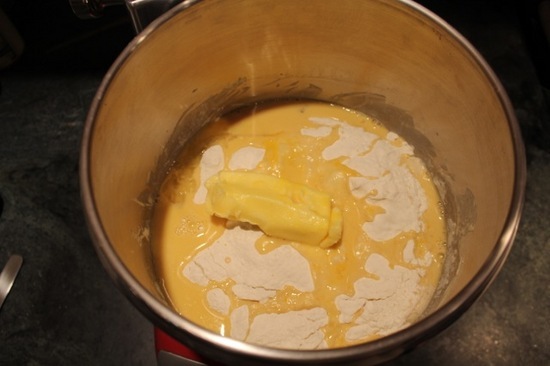 Make the Glaze In a small saucepan over medium heat (or in a 1 cup microwavable measure with a spout), melt the butter. 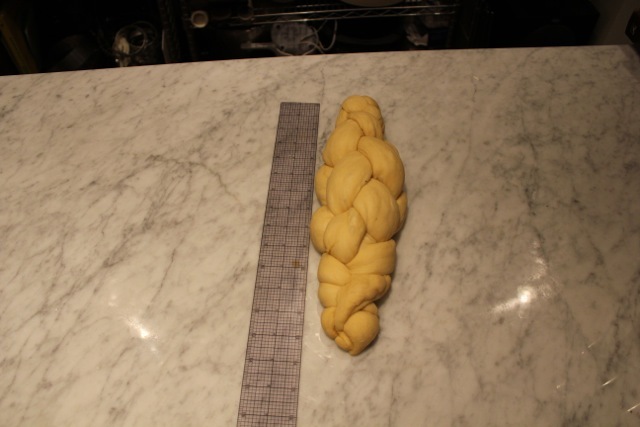 Unmold and Cool the Babka Lay a sheet of parchment on the counter and place a wire rack on top. 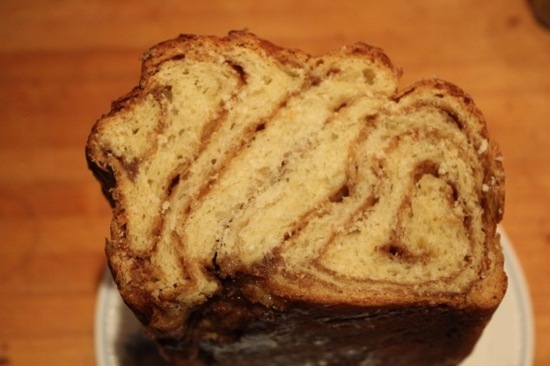 Remove the babka from the oven and unmold it onto the wire rack. 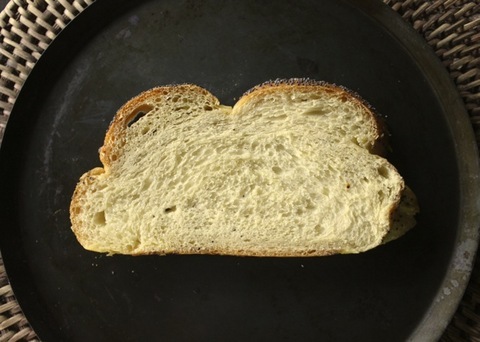 If necessary, use a small metal spatula to dislodge the bread at the short ends of the pan not lined with the parchment. Brush the melted butter onto the crust to soften it. Let the babka cool completely, about 1-1/2 hours. Store Room temperature, 2 days; airtight: frozen, 3 months. This very special bread is featured in my book The Baking Bible which will be published two days from now! It was inspired by one that my darling cousin Elizabeth Granatelli brought me after a visit to Club Med, where they present guests with a loaf of it at the end of each stay. I adapted a version using my Soft White Sandwich Loaf recipe from The Bread Bible as the base. Adding little cubes of white chocolate to the dough results in small lacy holes lined with a sweet coating of the chocolate. This bread proved to be quite a challenge because the white chocolate close to the surface of the bread became very dark brown. After seven tries, just as I was about to give up, I thought of a great technique: I held out about one-third of the dough before adding the white chocolate to the rest, and then wrapped the dough without the chocolate around the shaped loaf. I discovered that for the best oven spring and additional 1/2 inch in height, starting at a slightly higher temperature for the first five minutes of baking works well in my oven. As ovens vary in heat retention once the door is opened you may want to experiment with this method for this and other breads! 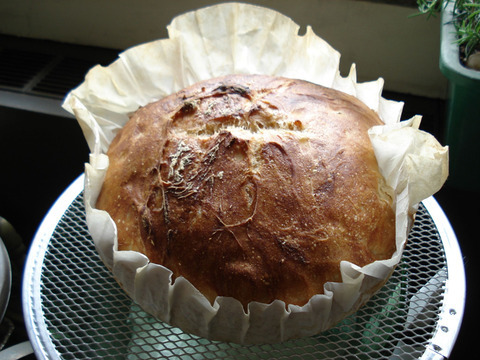 I'm so glad I persisted--this is fantastic bread, incredibly soft, light, and flavorful. It is especially delicious lightly toasted and spread with butter and strawberry jam or brushed with melted butter and sprinkled with cinnamon sugar! It makes a great and unusual breakfast or tea bread. And sweet/savory lunch spread with peanut butter and jelly or preserves. 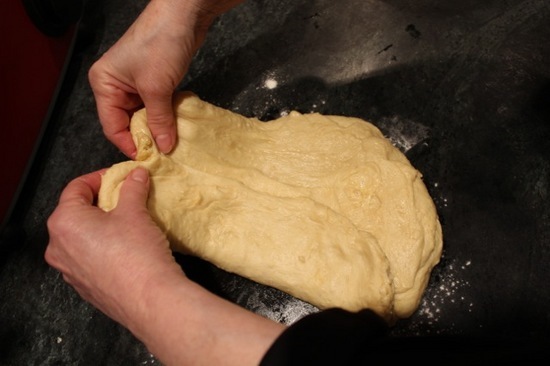 I am offering this preview from the book because it gives me the opportunity to provide many step by step photos illustrating this special technique of creating a dough 'skin' or envelope to encase bread doughs. 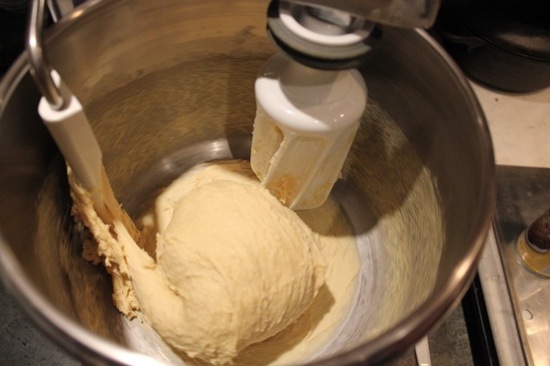 Make the Dough Starter (Sponge) In the bowl of a stand mixer, place the water, honey, flour, and yeast. Whisk by hand for about 2 minutes until very smooth to incorporate air. 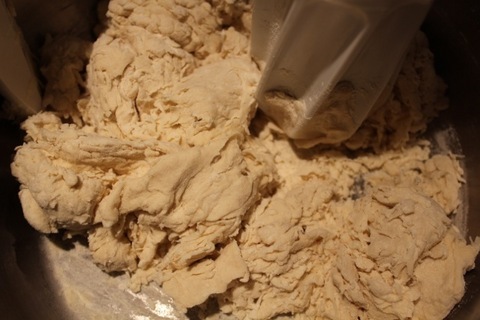 The dough will be the consistency of a thick batter. Scrape down the sides of the bowl. Cover with plastic wrap and set the starter aside while you make the flour mixture. 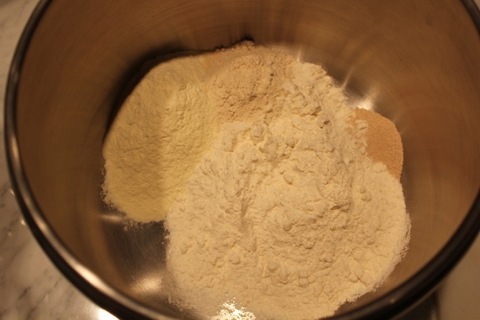 Combine the Ingredients for the Flour Mixture In a medium bowl, whisk together the flour, dry milk, and yeast. Sprinkle the flour mixture over the sponge, forming a blanket of flour, and cover it tightly with plastic wrap. Let it ferment for 1 up to 4 hours at room temperature, or 1 hour at room temperature and up to 24 hours refrigerated. 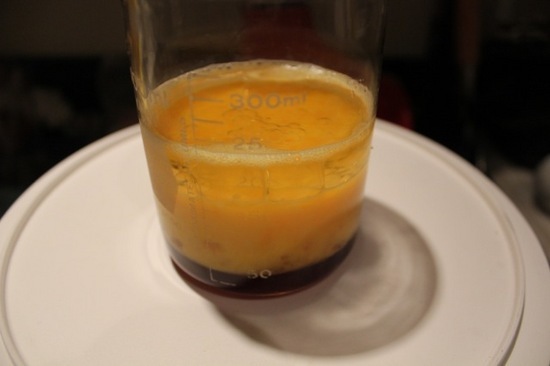 (If refrigerated, allow it to sit at room temperature for 1 hour before mixing.) During this time, the sponge will bubble through the flour blanket in places. 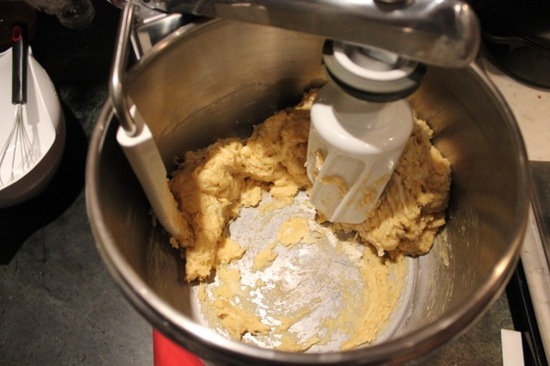 Mix the Dough Attach the roller if using the Ankarsrum, or the dough hook if using another stand mixer. 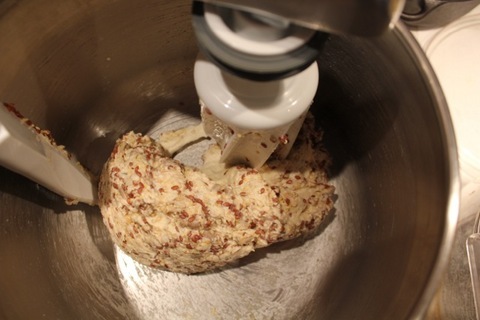 Add the butter and mix on low speed for 1 minute, or until the flour is moistened to form a rough dough. Scrape down the sides of the bowl for any bits of dough. Cover the top of the bowl with plastic wrap and let the dough rest for 20 minutes. Sprinkle on the salt and knead the dough on medium-low speed for 7 to 10 minutes. 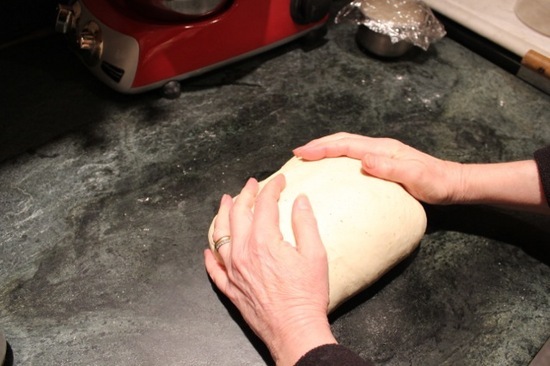 It may not come away from the bowl until the last minute or so of kneading. 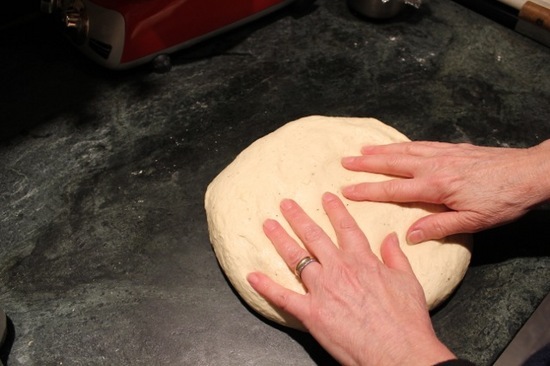 The dough will be smooth and shiny and stick to your fingers. With a spatula that has been lightly coated with nonstick cooking spray, scrape down any dough clinging to the sides of the bowl. Let the Dough Rise Using a spatula or dough scraper that has been lightly coated with nonstick cooking spray, scrape the dough into a 2 quart/2 liter dough rising container or bowl that has been lightly coated with nonstick cooking spray. Push down the dough and lightly coat the surface with nonstick cooking spray. 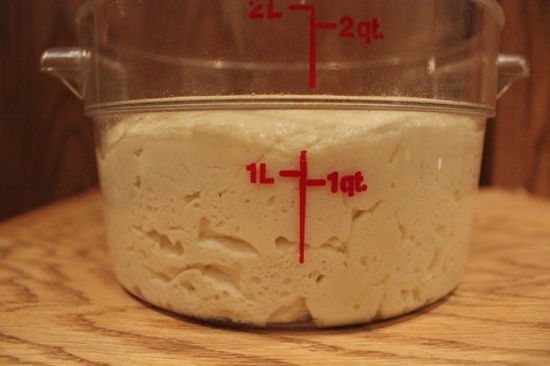 (The dough should weigh about 25.3 ounces/718 grams.) Unless putting it in an enclosed area with hot water, cover the container with a lid or plastic wrap. With a piece of tape, mark the side of the container at approximately where double the height of the dough should be after rising. 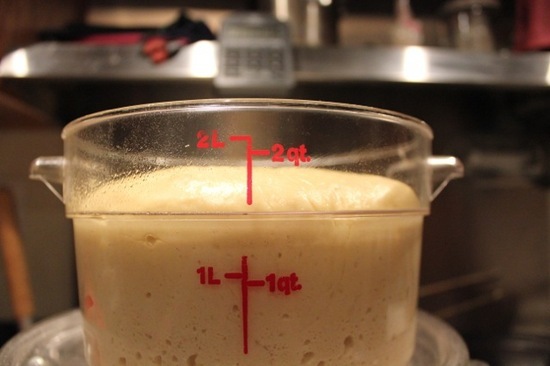 Let the dough rise in a warm place (ideally at 75° to 85°F/24°to 29°C) until it reaches the mark, 1 to 1-1/2 hours. 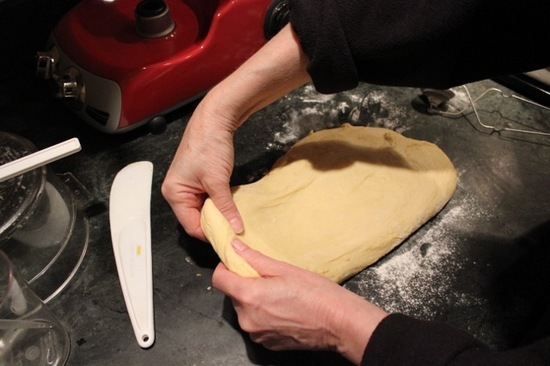 Deflate and Chill the Dough Using a spatula or dough scraper that has been lightly coated with cooking spray, turn the dough onto a floured counter and gently press down on it to form a rectangle. It will be full of air and resilient. Try to maintain as many of the air bubbles as possible. 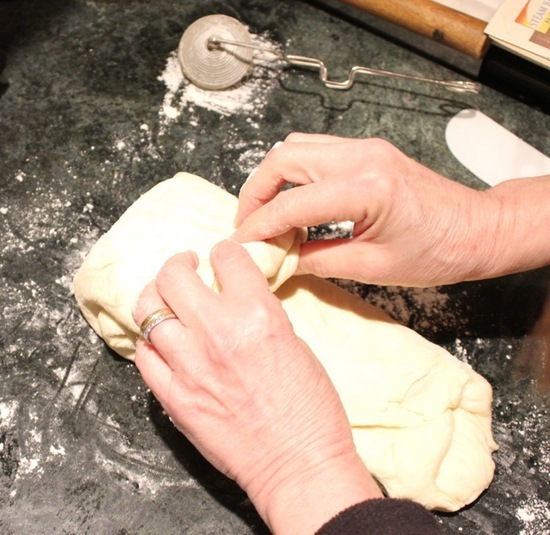 Give the dough a business letter turn (fold it into thirds), brushing off any excess flour, and again press down on it or roll it out into a rectangle. Rotate it 90 degrees so that the closed end is facing to your left. Give it a second business letter turn and round the corners. Set the dough back in the container. Lightly coat the top, cover, and refrigerate for 30 minutes to 1 hour to firm the dough for rolling. Shape the Dough and Let It Rise Turn the dough onto a lightly floured counter and press down on it with floured hands to form a rectangle. Roll the dough into a 12 by 6 inch rectangle, flouring the counter and the rolling pin if necessary to keep it from sticking. With a sharp knife, cut off a 4-1/2 by 6 inch strip (8.5 ounces/242 grams) from one end. 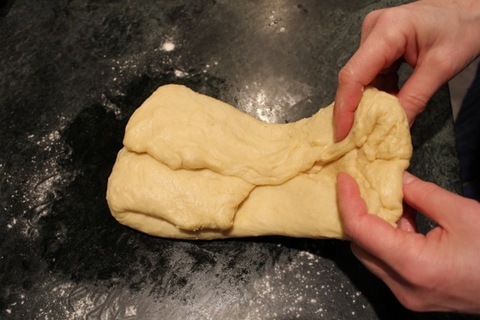 Wrap this dough lightly in plastic wrap and refrigerate while shaping the larger piece. 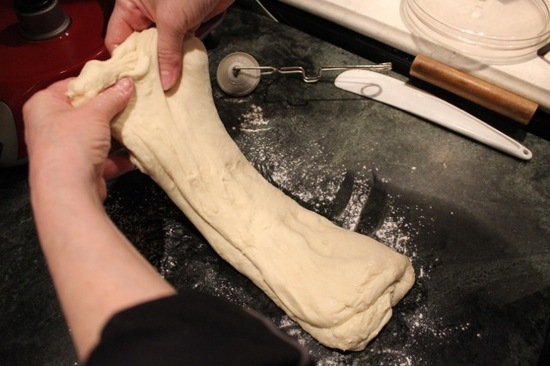 Roll the larger piece of dough to lengthen it to about 12 inches. Strew the white chocolate evenly on top of the dough. Roll up the dough to encase the chocolate and then knead it to incorporate the chocolate evenly. Sprinkle lightly with flour if it is very sticky. Set it aside, covered with plastic wrap, for 20 minutes. Lightly flour the counter and roll the dough containing the chocolate into a 9 by 8 inch rectangle. 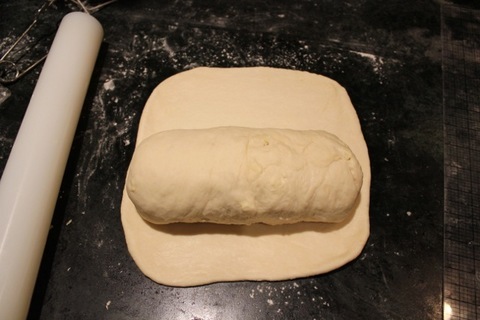 Shape the dough into a log, starting from the top and rolling down to the bottom. 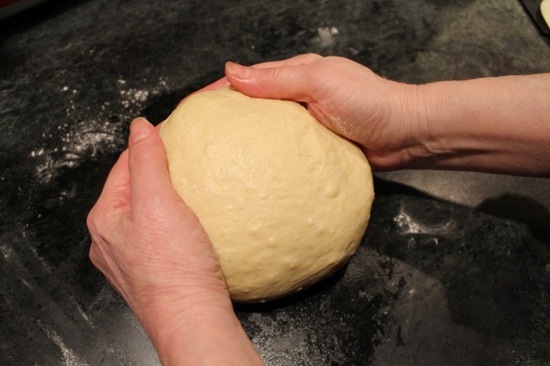 When you reach the bottom edge of the dough, pinch it firmly against the outside of the dough to make a tight seam. Set the shaped loaf, seam side down, on the counter. 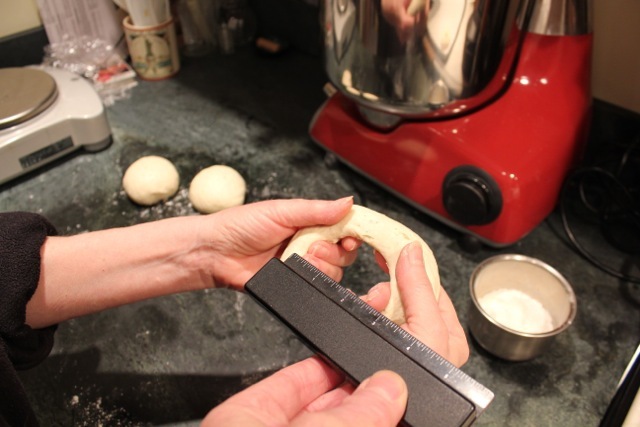 Roll the smaller piece of dough into a 9 by 8-1/2 inch rectangle. It will be about 1/8 inch thick. Lightly spritz or brush water on top. 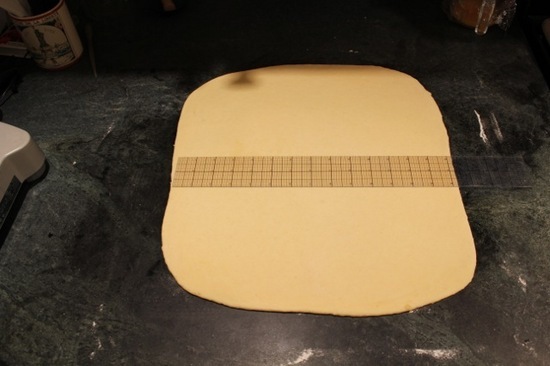 Set the shaped loaf, horizontally and centered near the bottom of the dough rectangle, seam side down. Wrap the dough rectangle snuggly around the shaped loaf so that the two edges meet, and pinch them together all along the bottom edge. 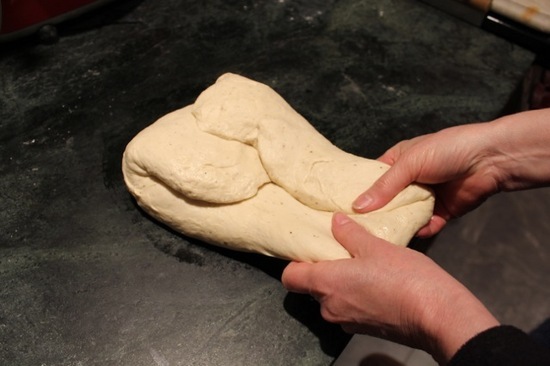 Set it seam side down on the counter and pinch together the sides of the dough to enclose the loaf. 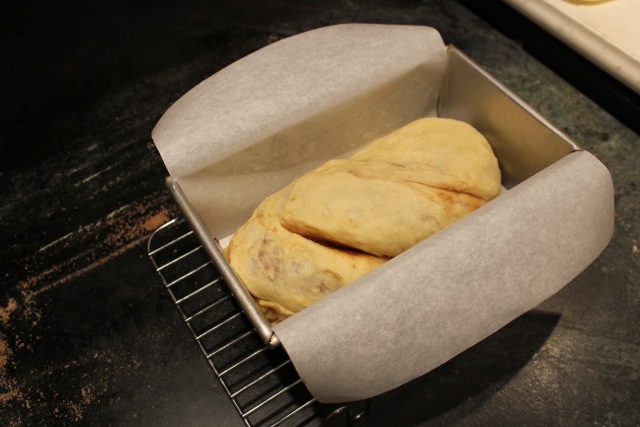 Tuck them under, and set the shaped dough in the prepared loaf pan, pushing it down firmly. It will be about 1 inch from the top. Cover the pan loosely with plastic wrap that has been lightly coated with nonstick cooking spray. 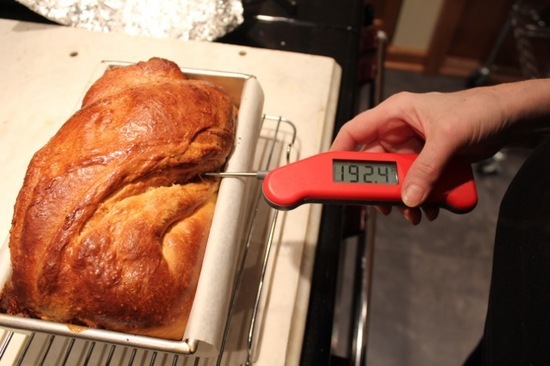 Let the bread rise in a warm place (ideally 75° to 85°F/24° to 29°C) for 1 hour and 15 minutes to 2 hours. The highest point should be 1 inch above the sides of the pan and when pressed lightly with a fingertip, the dough should keep the impression. Preheat the Oven Forty-five minutes or longer before baking, set an oven rack in the lower third of the oven and place the baking stone or baking sheet on it. Place a cast iron skillet, lined with aluminum foil to prevent rusting, or a sheet pan on the floor of the oven. Preheat the oven to 375°F/190°C. Cool the Bread Remove the bread from the oven, unmold it from the pan, and transfer it to a wire rack to cool completely, top side up, at least 2 hours. Store Room temperature, 2 days; airtight: frozen, 3 months. Use standard supermarket clover honey such as Gold Blossom or Sue Bee, as they are pasteurized so the enzymes will not kill the yeast. 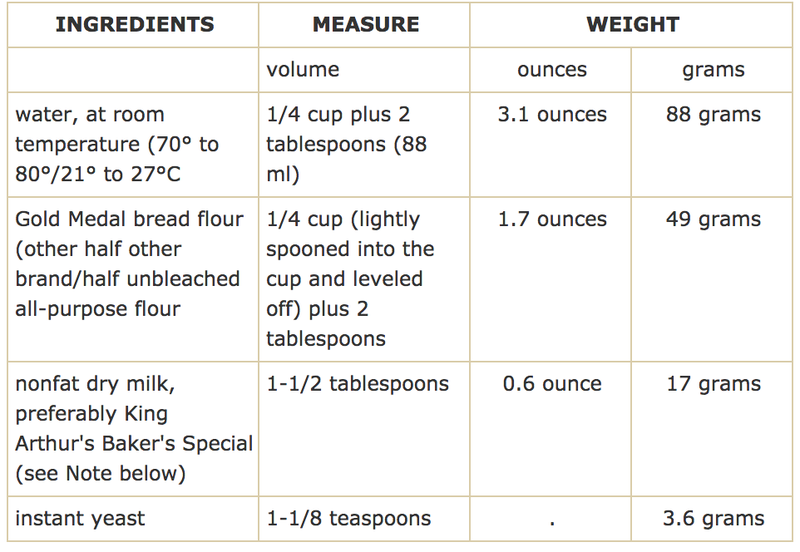 2 tablespoons is the volume for 0.8 ounce/23 grams of King Arthur's Baker's Special Dry Milk. 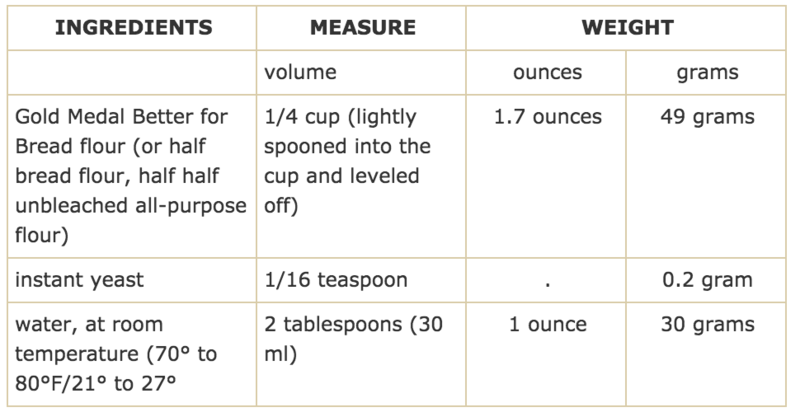 If using another brand of "instant" dry milk, use the same weight, which will be double the volume (1/4 cup). SETTING THE WHITE CHOCOLATE DOUGH LOAF ON TOP OF THE DOUGH "WRAPPER"
When I was growing up, we had bakery bought challah every Friday night. I had one piece with honey and then waited til the following Friday night because the next day the challah became too dry for my taste. 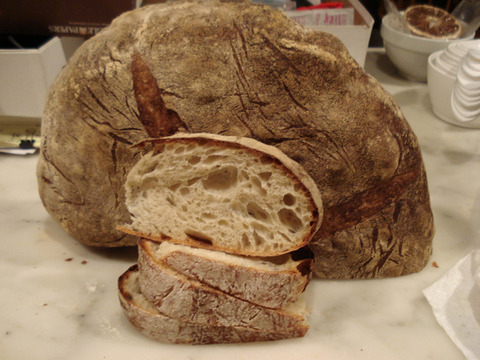 In recent years, I discovered that the addition of old sourdough starter or easy to make biga significantly extends the wonderful soft texture. I recently did a side-by-side test of bread dough made with old sour dough starter versus biga and found that the breads made with added sourdough starter and biga were identical in flavor and texture providing the biga is mixed three days ahead of baking, so have incorporated this technique into many of my bread recipes. 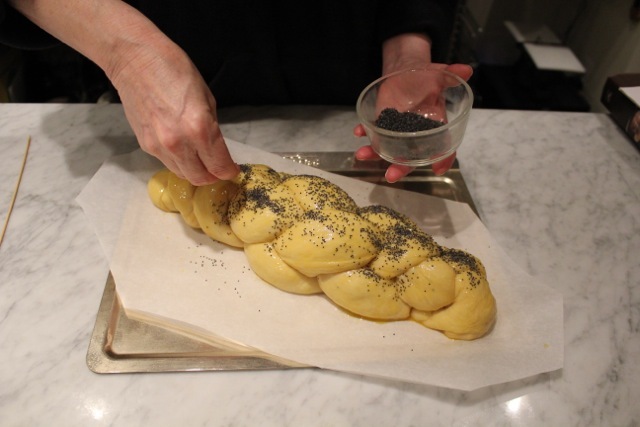 Challah is traditionally made with oil so that it can accompaniment a meat meal, however, it also can be made with butter which is still more delicious. The dough can be made a day ahead of baking but the best rise is when baked on the same day as mixed! Cushionaire or two stacked pans are needed for this rich sweet dough to prevent over-browning of the bottom. Note: A baking stone serves to maintain the oven temperature when the door is opened. If you don't have one, preheat the oven temperature to 350°F/175°C and lower it to 325°F/160°C after the first 5 minutes of baking. 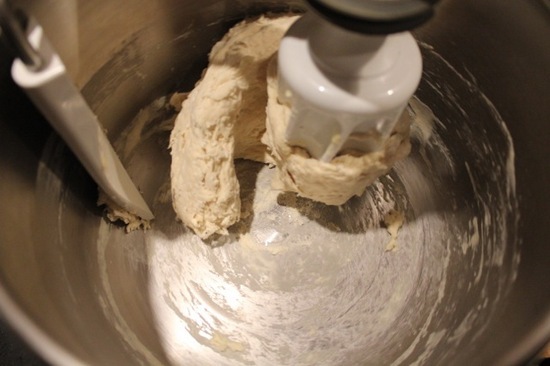 Mix the Dough Into the bowl of a stand mixer bowl, fitted with the roller attachment for an Ankarsrum, or dough hook for other stand mixers, pour the water. Use sharp scissors, dipped in water if it is sticky, to cut the starter into many small pieces, letting them drop into the water. Allow it to sit, covered, for at least 30 minutes. 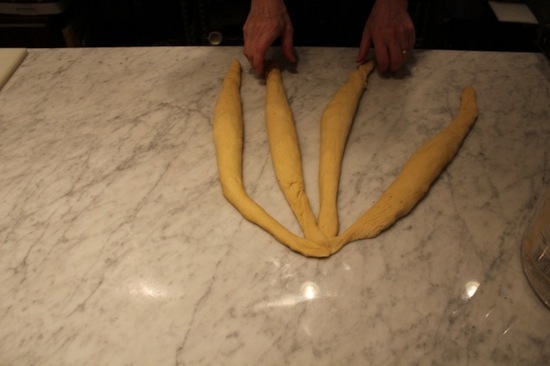 In a medium bowl, whisk together the flour and yeast; then the salt. 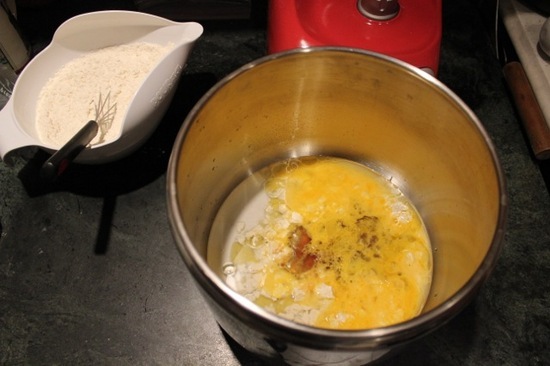 Add the eggs, honey, and corn oil or butter to the mixer bowl. 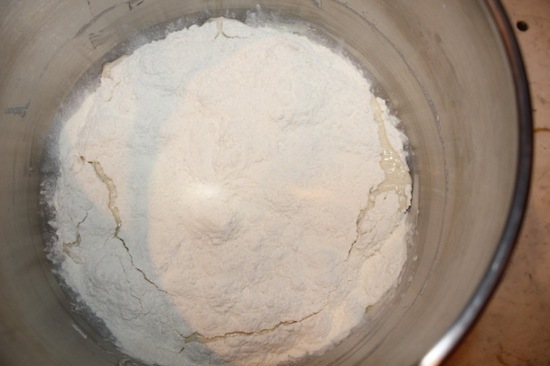 Add the flour and mix on low speed for about 1 minute, until the flour is moistened. Raise the speed to medium-low and knead for 7 minutes. The dough should be just barely tacky. Shape the Dough, Glaze It, and Let It Rise Dust the counter top with flour and divide the dough into 4 equal pieces (212 to 217 grams/7.5 to 7.6 ounces each). 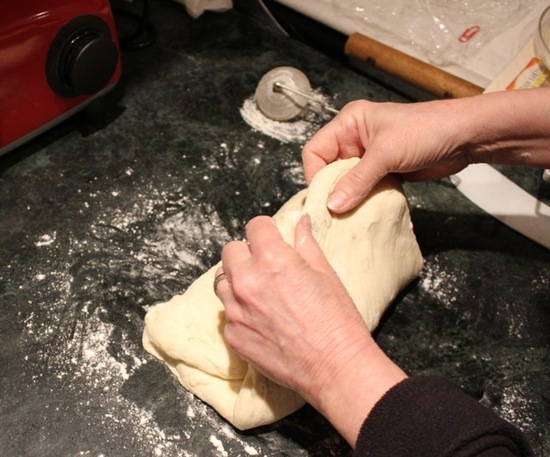 Shape each piece of dough into a small logs. 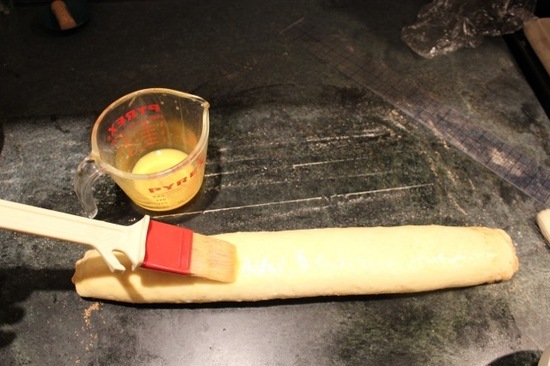 Cover the dough logs with a large plastic box or plastic wrap that has been lightly coated with nonstick cooking spray and allow them to rest for 20 minutes. Start by rolling one piece of dough on the counter into a 13 inch long rope. (Keep the rest covered while working with one at a time.) Let the dough rest for 20 minutes. 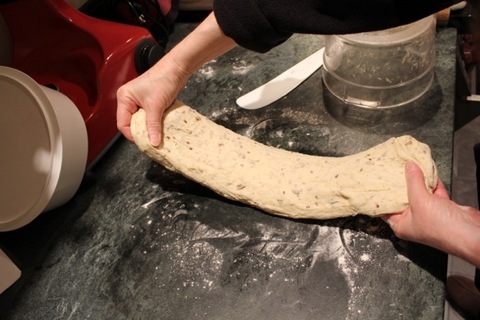 Starting at the middle, lengthen the dough rop to about 19 inches. Apply more pressure toward the last 4 inches of each end so that they are tapered. 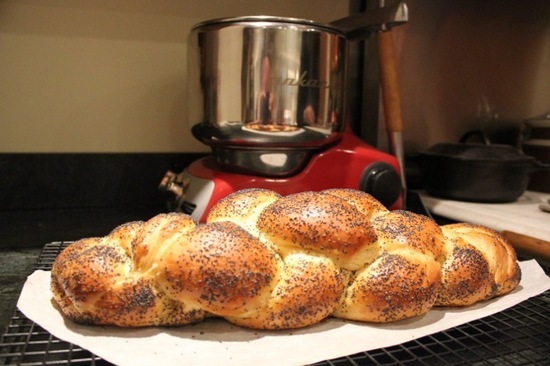 A four braid challah is the most attractive but a three braid is also beautiful. 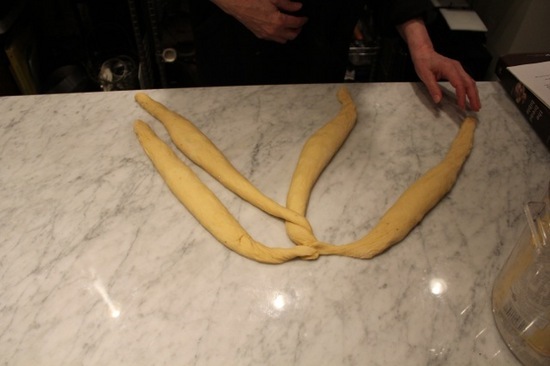 Start from one tapered end by pressing the ends of the dough together. 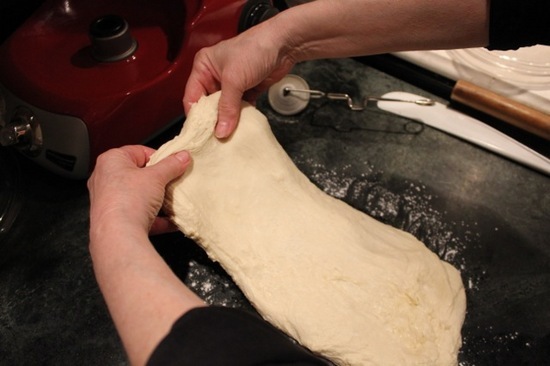 As you come to the other end of the braid, pull the dough more so that it comes to more of a point. Pinch the strands together at each end of the braid and tuck them under to make sure they don't come apart during rising and baking. Braid tightly, especially in the middle, so that the dough doesn't spread too much when rising and baking. 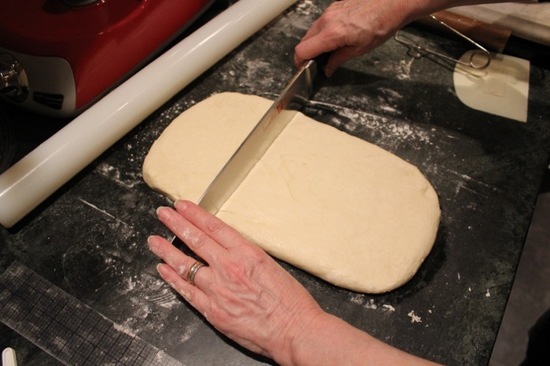 Push the ends together a little so that the loaf is about 12 inches long by 4 inches wide by 2-1/4 inches high. Place the loaf on the prepared baking sheet. Brush with the glaze and cover with a large plastic box of plastic wrap that has been lightly coated with nonstick cooking spray. Let the loaf rise to 13 by 5 by 3 inches high. Preheat the Oven: Forty-five minutes or longer before baking, set the oven shelf at the lowest level and place a baking stone or baking sheet on it. Preheat the oven to 325°F/160°C. Note: Use standard supermarket clover honey such as Gold Blossom or Sue Bee, as they are pasteurized so the enzymes will not kill the yeast. 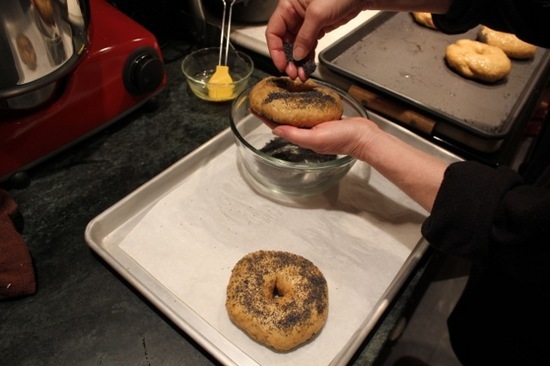 If you've never had a homemade bagel you are in for a great surprise. Most commercial bagels lack the delicious complexity of flavor and the pleasant degree of chewiness. The chewiness is a result of using high gluten flour but as this is not readily available in supermarkets I decided to make my own by using Gold Medal Better for Bread flour and adding gluten. It worked perfectly. The dough is quick to make and then can stored overnight before shaping, making it an ideal weekend project. Authentic bagels need to be boiled before baking. The shaping, boiling, and baking are somewhat time consuming, therefore it behooves you to make a batch of an adequate size and power. 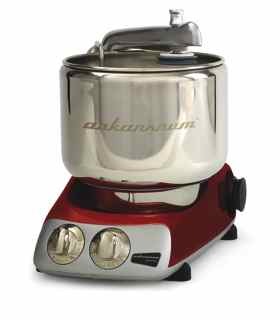 This is only possible with a heavy duty mixer and the Ankarsrum is ideal. Bagels are very much a part of my heritage. My first bread memory and my first teething ring are one and the same. My mother, who was a dentist, considered the bagel an ideal natural teething ring because of its firm yet forgiving texture. But it was my father who brought us freshly-baked bagels on a string every Friday afternoon after he made his weekly delivery of bagel peels. In the 1940's after the war and the early 1950's, when times were hard, my father Robert Levy, a skilled cabinet maker, turned to bagel peel production and laid claim to the exclusive bagel peel business in the greater New York area which included the five boroughs and all of New Jersey. This did not make us rich, but we had all the bagels we could eat. A peel is a flat wooden pallet with a long pole as a handle, designed for transferring bread to and from the oven in commercial bread bakeries. Peels used for bagels are only slightly wider than the bagel itself. In traditional bagel production, the bagels, after being boiled in salted water, are placed on a wooden board and set in the oven, often as deep as 20 feet. When the tops of the bagels are firm, a piece of string is run under the bagels to release them and they are inverted onto the hot oven shelf. The peel is used to move them about so that they bake evenly and to remove them from the oven. Making my bagel recipe in a home oven, however, does not require a bagel peel, however, I regret that my father did not save one of his for me to put up in my kitchen as decoration. Combine the Dry Ingredients for the Flour Mixture In the bowl of the stand mixer, whisk together 5-2/3 cups (26 ounces/736 grams) of the flour, the vital wheat gluten, the yeast, malt, sugar, and black pepper. Mix the Dough Add the butter, if using, and water, and with the dough hook, starting on low, mix until all the flour is moistened, about 2 minutes. Add the salt and knead for another minute. Raise the speed to medium-low and knead for 5 minutes. Add all but 2 tablespoons/0.6 ounce/ 16 grams of the remaining flour. 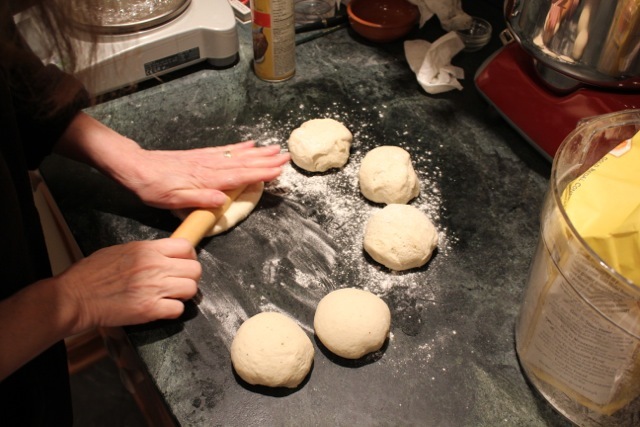 Continue kneading for 2 to 3 minutes, until most of the flour is incorporated. The dough should be barely sticky. If necessary, knead in some of the remaining flour by hand. (More flour will make a heavier, chewier bagel which some prefer.) Shape into a smooth ball. Let the Dough Rise Place the dough into a 4 quart/4 liter dough rising container or bowl that has been lightly coated with cooking spray. Push down the dough and lightly coat the surface with nonstick cooking spray. 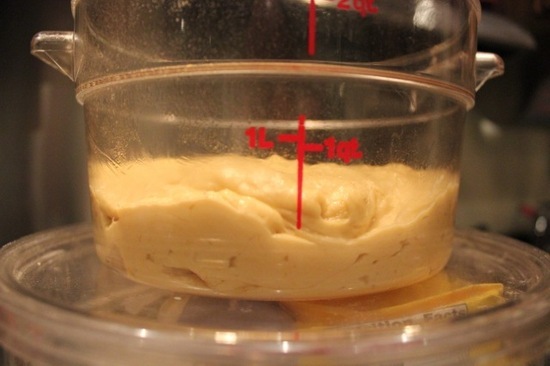 (The dough should weigh about 51.6 ounces/1,464 grams). Unless putting it in an enclosed area with hot water, cover the container with a lid or plastic wrap. 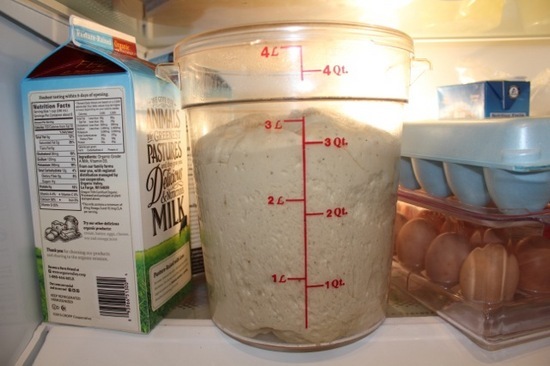 With a piece of tape mark the side of the container at approximately where double the height of the dough should be after rising (3 quarts/3 liters). 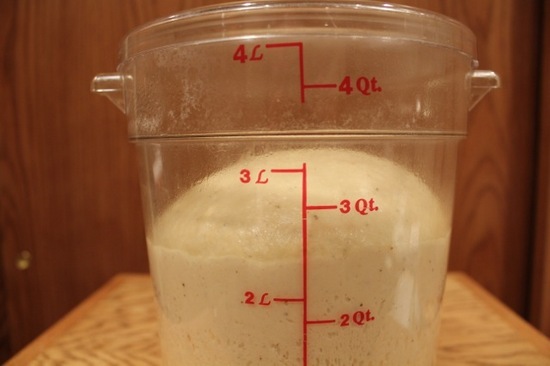 Let the dough rise in a warm place (ideally at 80°F/27°C) in a proofer or microwave with a glass of very hot water), for 1 to 1-1/2 hours or until it reaches the mark. 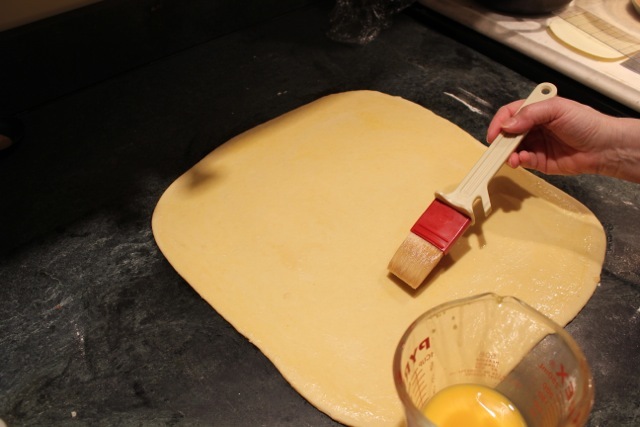 Using a spatula or plastic dough scraper that has been lightly coated with nonstick cooking spray, turn the dough onto a lightly floured counter and gently press down on the dough to form a rectangle. 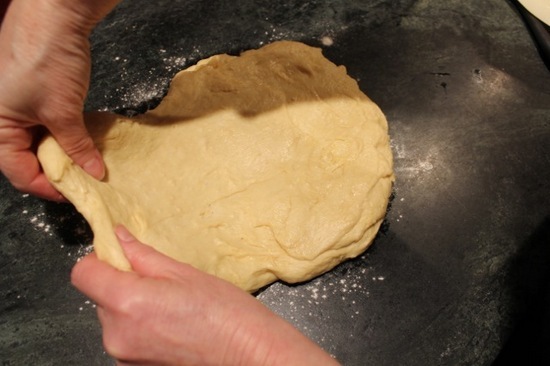 Deflate the dough by firmly pushing it down, give it a four-sided stretch and fold. Round the edges and set it back into the container. It will now fill the container to 2 quarts. Lightly coat the surface of the dough with nonstick cooking spray. Cover it, and refrigerate it for at least 4 hours, preferably overnight or up to 2 days for the most dimensional flavor. 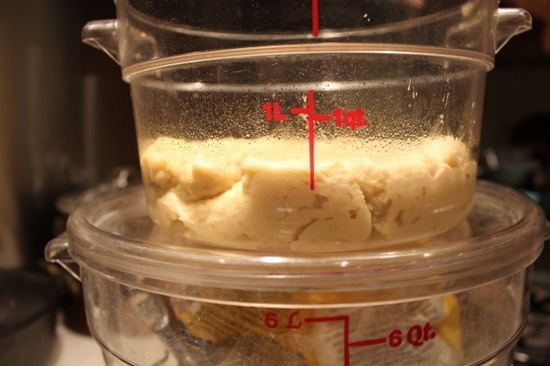 Check the dough after the first hour and if it has risen to 4 quarts use your fist to push it down. Check again after the next hour and repeat the deflating. 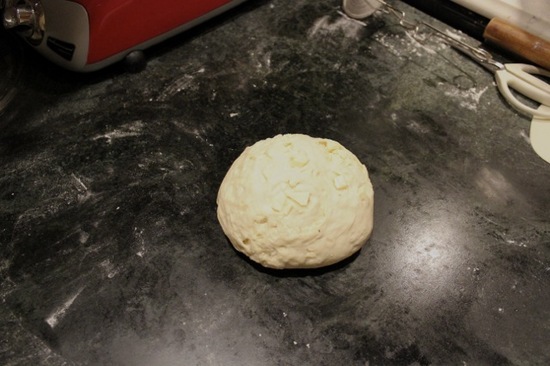 Shape the Dough and Let it Rise Set one parchment-lined baking sheet on a counter top near the cooktop. 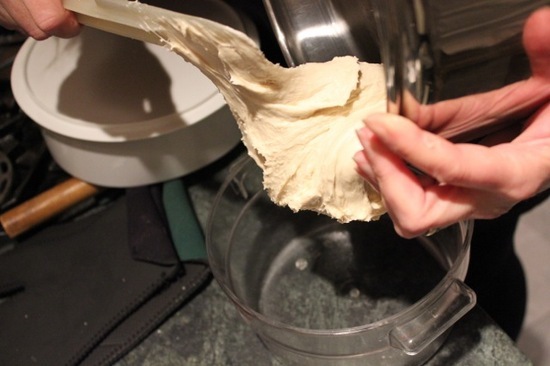 Transfer the dough to a lightly floured counter. Divide it in half. Set one piece back in the container, cover and refrigerate it. 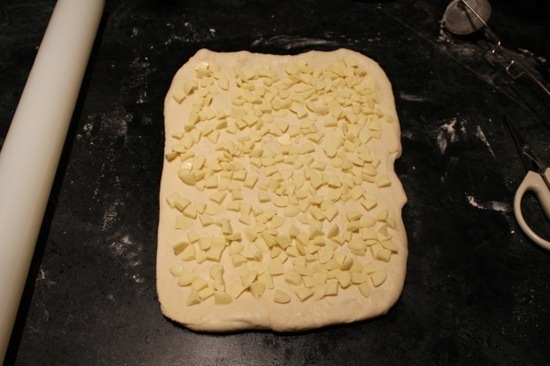 Cut the dough into 6 equal pieces (4.2 ounces/ 120 grams each). With the smooth side up, tuck under the edges to round each piece into a roughly shaped ball. 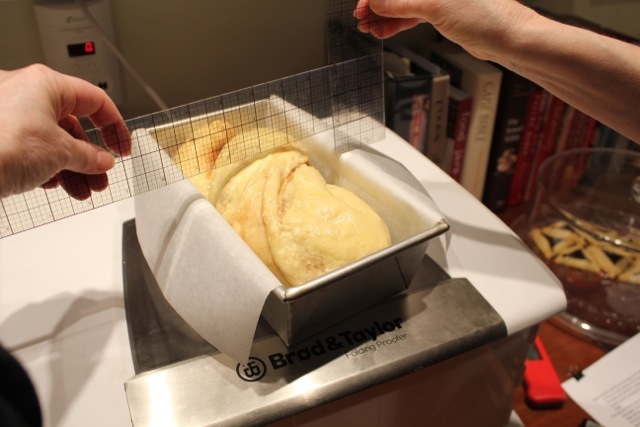 Cover with plastic wrap and allow the dough to relax for about 10 minutes before shaping. 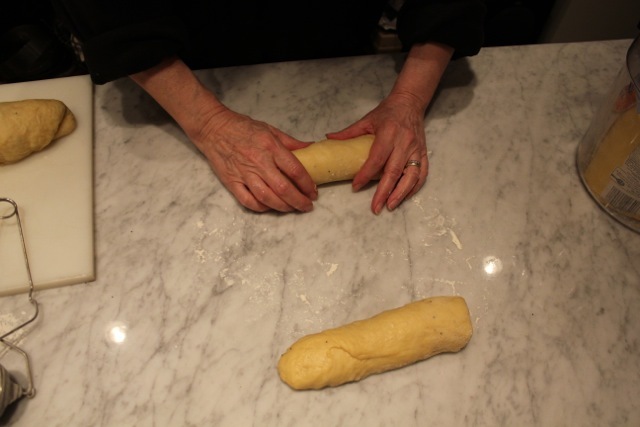 Shape the Dough Begin by setting a dough ball, smooth-side-down, on a lightly floured counter. 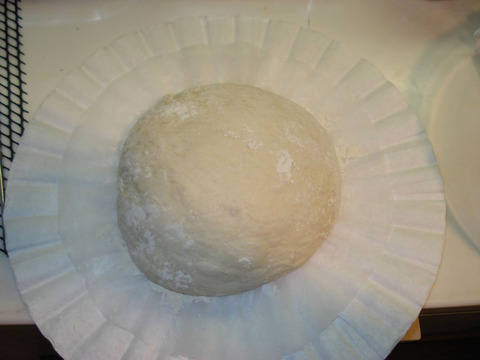 Lightly flour the top and use a small rolling pin to flatten it into a disc. Draw up the sides and pinch it together to form a smooth round ball, resembling a head of garlic. Turn over the ball so that the pinched seam is on the bottom. 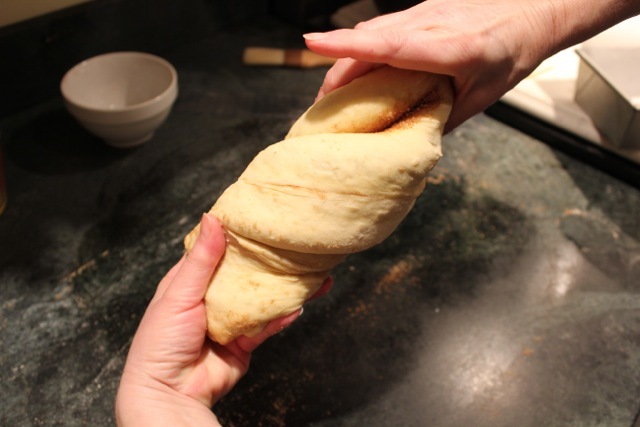 Cup your hand over the dough and move it to an unfloured part of the countertop so that it can grab on slightly. 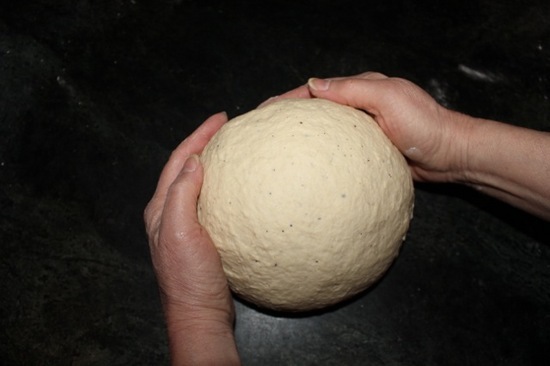 Pressing lightly, rotate the dough to form a smooth round ball. Stick your index finger or the back of a wooden spoon into the center of the ball, all the way through to the bottom to make a hole. Begin by hooking it over your thumb and insert two fingers of your other hand into the hole, to open it up. 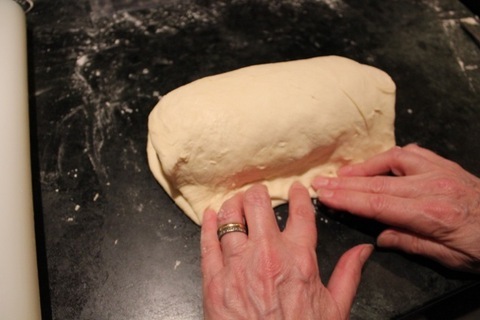 Then use the fingers of both hands to stretch and rotate the dough to make a hole about 3-1/2 inches in diameter. 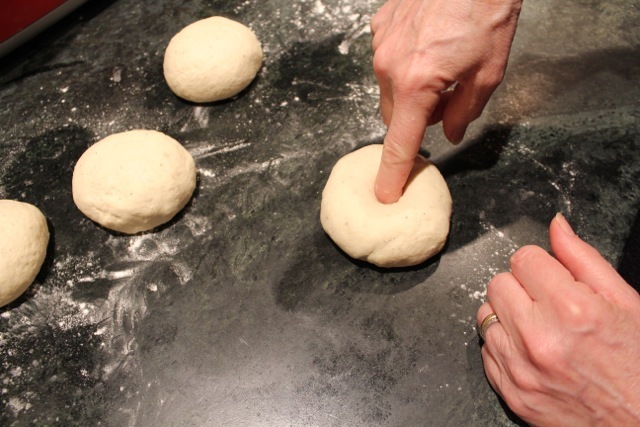 The dough will resemble a ring and will be about 3/4 inches high. 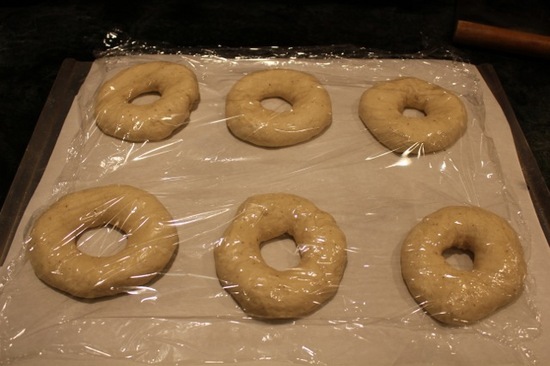 Place each bagel as you shape it on the parchment-lined baking sheet, covering it lightly with plastic wrap. 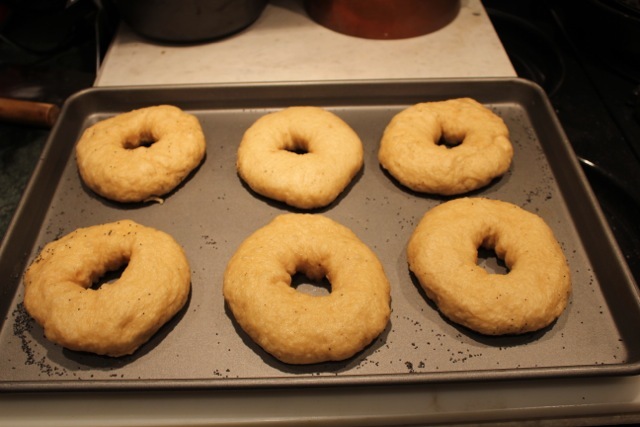 Allow the bagels to rise for 10 to 15 minutes or until they puff slightly to 1 inch high. If using toppings, scatter one-quarter of them on a half sheet pan. Preheat the Oven Forty-five minutes or longer before baking set an oven rack at the lowest level and place the baking stone or baking sheet on it. Preheat the oven to 500°F/260°C. Boil the Bagels Set several paper towels on the countertop near the cooktop. Set a parchment lined baking sheet next to them. If you are using seeds, instead of setting the boiled bagel directly onto a parchment lined baking sheet, first scatter half the seeds evenly over the bottom of the uncoated half sheet pan. 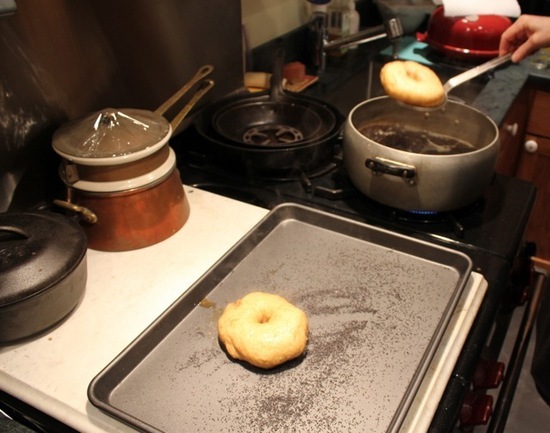 (After glazing and coating the top with seeds, transfer the dough rings to the parchment-lined baking sheet.) Fill a large stockpot (about 9 inches by 4 inches high) about half full of water to a boil. Stir in the molasses and baking soda until dissolved. With a skimmer transfer the bagels, one at a time, into the boiling water without crowding them. Do them in batches of 2 to 3 at a time so that they can swim around without touching each other. If slightly under-risen, they may sink at first but then rise to the surface. Boil for 1 minute on each side, starting with the top side up, and then gently flipping them over with the skimmer. Remove the bagels, shaking off excess water over the stockpot. Slide the bagels onto the paper towels. 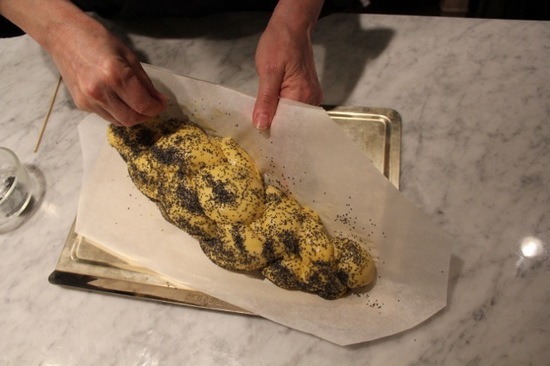 Use the towels to flip the bagels, top side up onto the parchment lined baking sheet or onto the poppy seed lined baking sheet and lift off the towels. The bagels will look slightly wrinkled at this stage but the surface will smooth out on baking as they expand slightly. They will have puffed up to about 1-1/4 inches and the holes will have closed to about 1 inch. 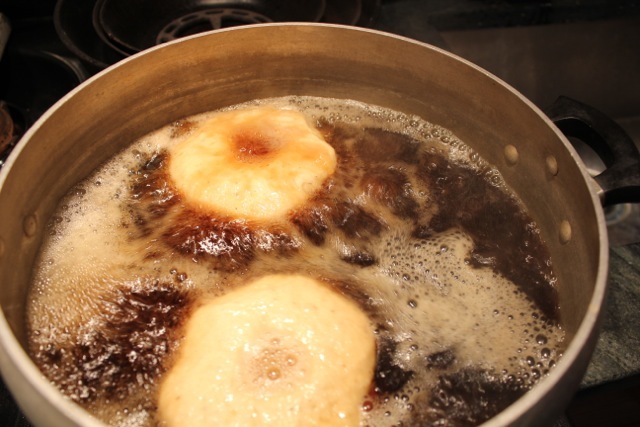 Set the stockpot aside until ready to boil the second batch and when ready, bring the mixture to a boil before sliding the bagels into the water. Start shaping the second batch after the first batch is in the oven. Glaze and Top the Bagels Whisk together the egg whites and cold water to break up the whites. 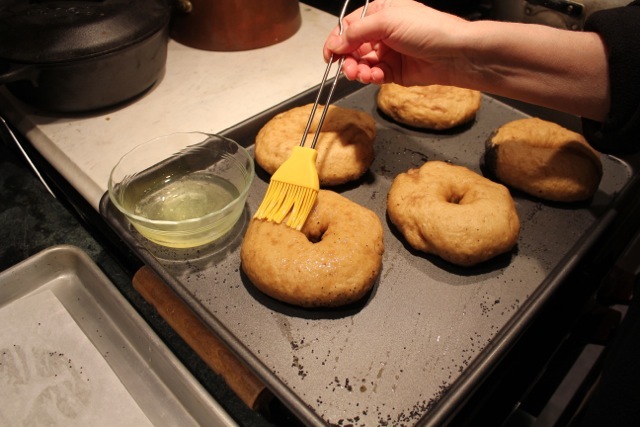 Press them through a fine mesh strainer and brush each bagel with the glaze. Do not let the glaze drip onto the baking sheet. 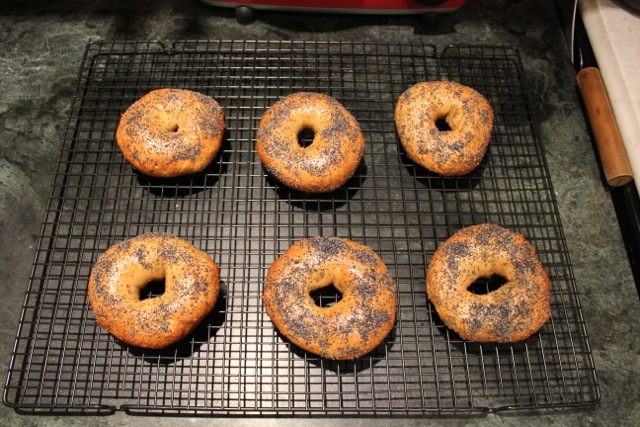 Brush with a second coat of glaze and, if desired, sprinkle any topping of your choice evenly over the bagels. 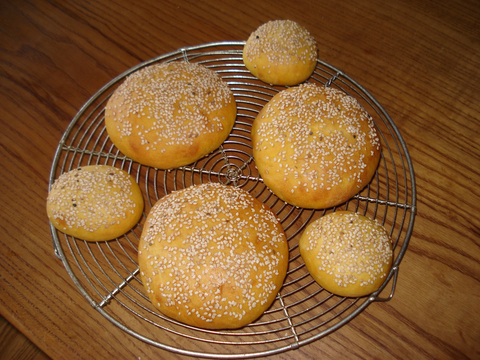 (Lift each bagel with your hand and, holding it over the pan with the topping, sprinkle the seeds or onions on top. This way you don't have any excess toppings that would burn on the baking sheet.) Set the bagels, evenly spaced, on the parchment lined baking sheet. Cool the Bagels Transfer the bagels to a wire rack and cool completely. Repeat glazing and baking with the second batch. Store The bagels keep well for 1 day at room temperature in a brown paper bag. For longer storage, wrap each in plastic wrap and then in plastic freezer bags and freeze for up to 1 month. Thaw, still wrapped, at room temperature. Butter, though not traditional, will produce a softer and lighter crumb. My preference is without it. The barley malt added to the dough contributes flavor and the slightest hint of sweetness. 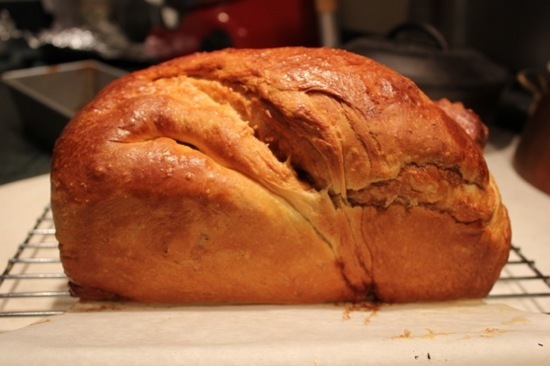 Baking soda helps to create a golden color to the crust. Molasses contributes extra shine. French toast is the perfect indulgence for breakfast in bed. It is easy to make and is best made the day or night ahead. 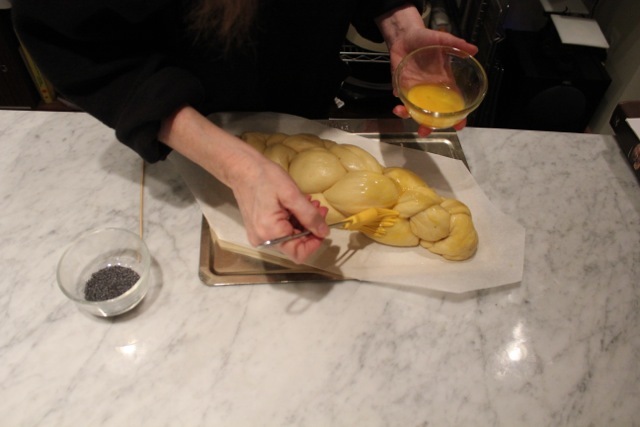 Glazes for Bread: Did you Know? 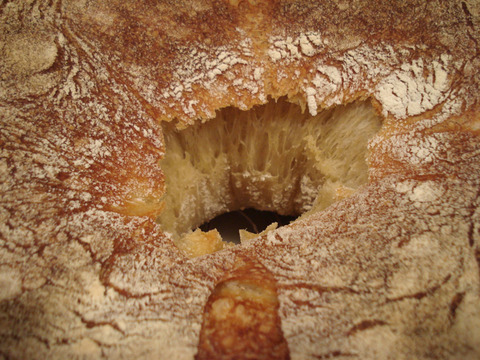 The quality of bread crust is not determined only by the type of bread being baked. There are glazes and toppings that can help to achieve a range of textures from soft and velvety to crisp and crunchy. 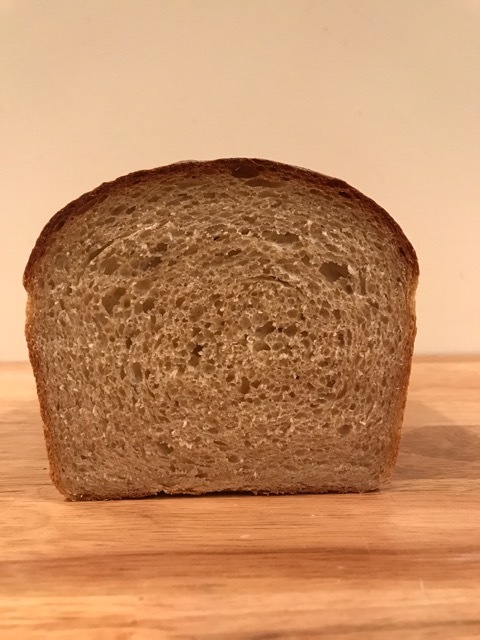 I've made my own sprouted wheat and added it to bread and while the results were delicious, the sprouts that rose to the surface became unpleasantly hard enough to encourage me to abandon the practice. So imagine my delight when chef/author/teacher par excellence Peter Reinhart told me he was offering a class on bread made with sprouted wheat flour. 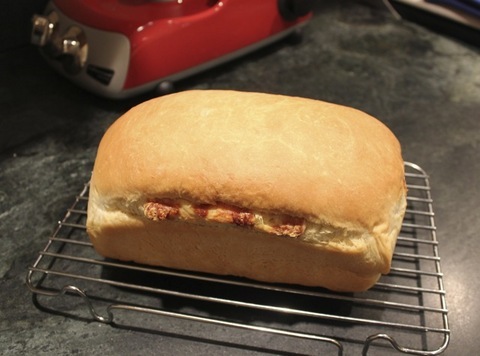 So this time, I made it with all water and have to report that if you're looking for a super quick and easy basic sandwich loaf, this is a winner. Time for Burger Buns Again! Instead of making 4 buns i made 3 and used the remainder for the 3 little slider buns (50 grams/1.7 ounces each). They take only 10 minutes to bake. And I used egg white instead of water to help the sesame seeds adhere better. here's the link to the original posting with recipe. I hope by now you've all bought or checked out from the library Maggie's wonderful book Artisan Baking. It's worth it for this recipe alone--The Royal Crown's Tortano, which is one of my very favorite breads. I was enticed to make it by the description that it had holes the size of radishes! 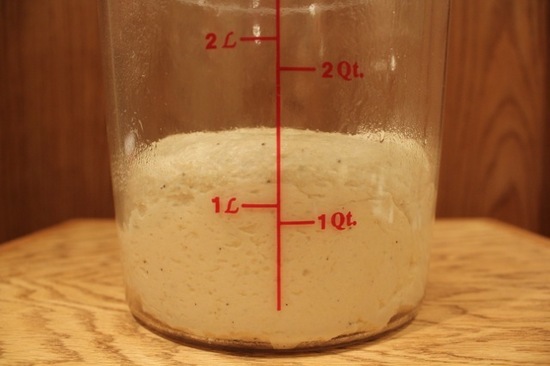 There is the most minute amount of yeast (0.3%) which means that the dough rises long and slow developing still more flavor. If these pictures don't tempt you I don't know what will! 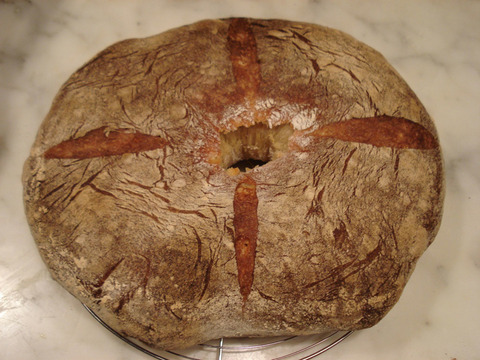 Another Word on No Knead Bread! 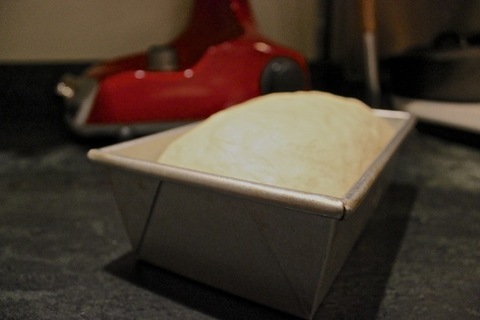 Since this has turned out to be one my husbands top three favorite breads, I decided to streamline the process of placing the sticky dough into the 500˚F cast iron Dutch oven. Someone had mentioned success with letting the dough rise on parchment and then using the parchment to lower it into the pan. I tried this and it worked well except that the parchment on the sides pleated and made the crust look less attractive. Next try was spraying the coffee filter with vegetable shortening and flour spray. It stuck just about as badly. 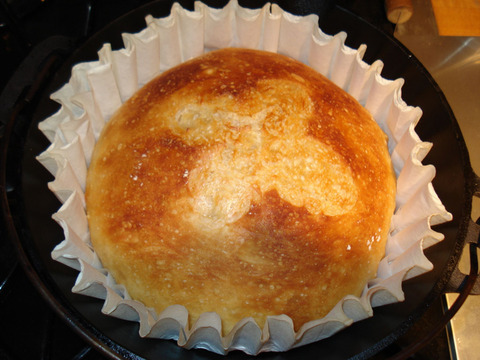 Finally I lined the inside of the coffee filter with a 13-inch round of teflon-type paper and that worked like a charm. I'm sure that a round of parchment or even foil would work about as well. 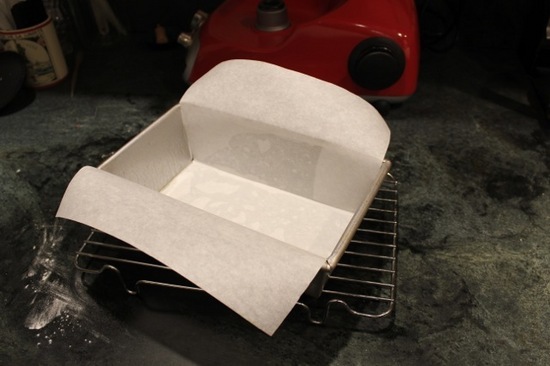 You need to have the pleated cup-shaped filter lie flat so put a weight such as a can of either side. Set the 13 inch round on top and then center the dough on top of it. Remove the weights and the sides of the filter will curve up. 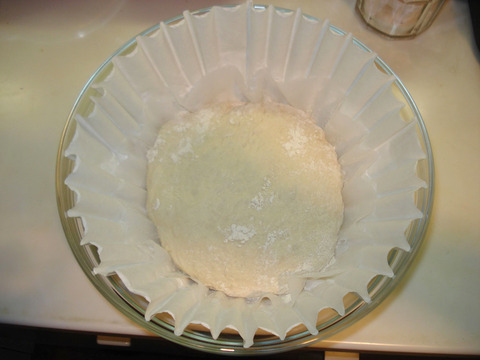 I lifted the edges of the filter and set it in a bowl to give the dough support while rising. When the dough has risen to the point that when pressed it fills the depression in slowly (wet your finger first so it won't stick) use sharp shears, run under cold water to prevent sticking to cut a deep cross in the top of the dough and lifting the sides of the filter lower it into the preheated Dutch oven.